Branden Juarez is the NEW Pro Wrestling Phoenix Heavyweight Champion! Well as unpopular as it may be, and not without underhanded tactics – Branden Juarez is the NEW Pro Wrestling Phoenix Heavyweight Champion! On Saturday February 15th, Juarez will team with ”Showtime” Bradley Charles to take on Matty Star and the man who shockingly came to his rescue last Saturday, his former nemesis, Ryan Slade! Tickets available now at ProWrestlingPhoenix .com! 1.) PWP Tag Team Champion Hype Gotti defeated “Showtime” Bradley Charles. 2.) 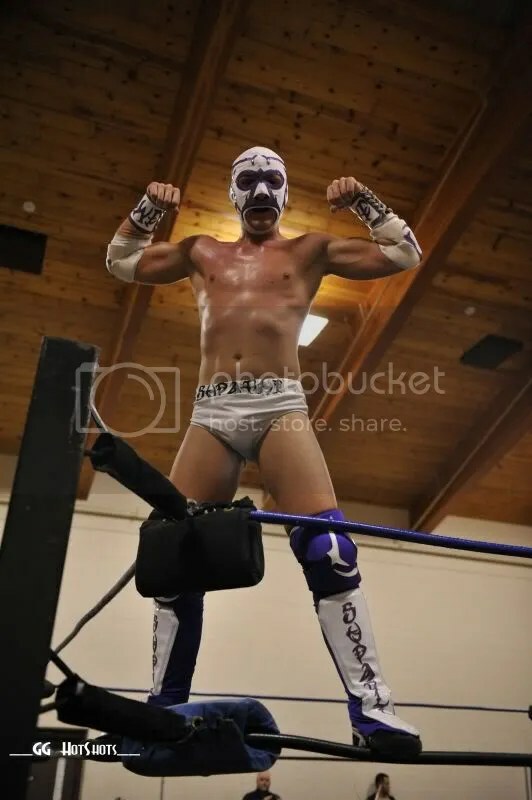 Mad Dog McDowell defeated “The One Man Cartel” Cuco Santiago. 3.) 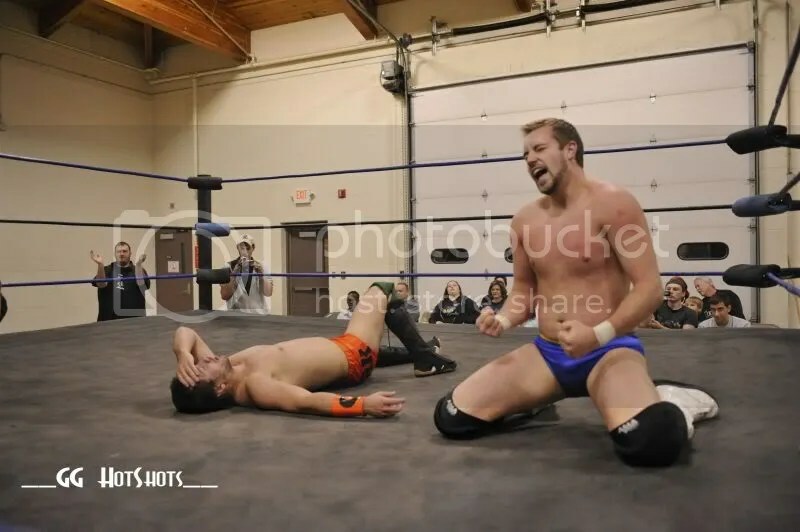 “The Passion” Zac James defeated “American Fury” Jon West with his feet on the ropes! 4.) 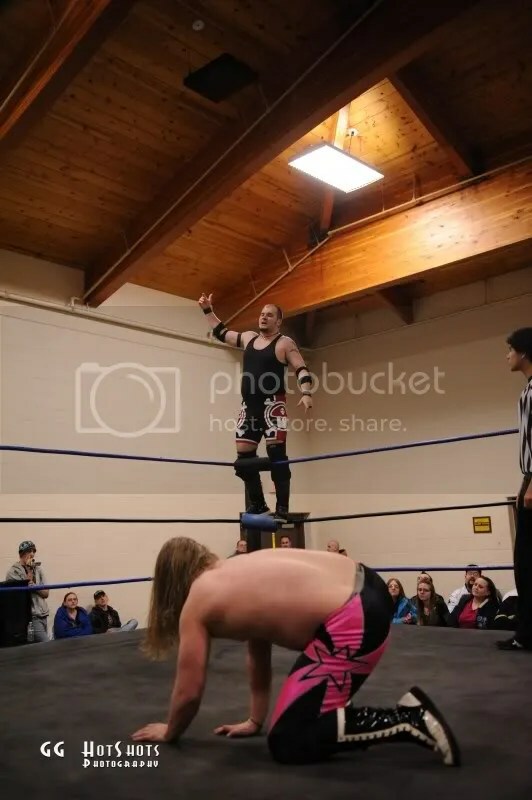 PWP fan favorite Chris Havius returned for the night to answer “Manager Supreme” Axel Greece’s open challenge and defeat Joey Daniels! 5.) Darren “Thunder” Russell defeated Leslie Ray. After the match Leslie Ray attacked Russell and joined Axel Greece as he announced it was the “era of L-Ray”! 6.) PWP Tag Team Champion “The Big Hurt” Abu Colossus defeated Ryan Slade. 7.) 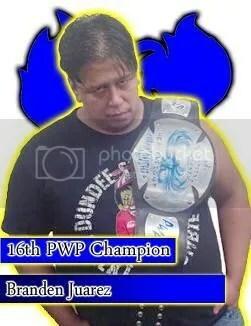 In a shocking turn of events, Branden Juarez defeated Matty Star to become the NEW PWP Heavyweight Champion after “Showtime” Bradley Charles interfered. After the match Juarez & SBC were attacking Matty, and RYAN SLADE of all people came to his aid! Slade explained that while he does not like Matty Star, he does respect him, and was not going to stand by while Matty was beat down 2 on 1. Slade & Matty then challenged Juarez & SBC to a tag match on February 15th and it is officially the main event for that evening! More details for February 15th coming soon! When the chips are down and bleak you find out who the real men are. That’s what happens when the promotion Pro Wrestling Phoenix found themselves under siege from the Murder Milita. With no hope in sight and Miltia’s Jerem y Wyatt, Mark Sterling, Joey Daniels, Jayden Draigo and Brett Young in charge, an unlikely team would save the PWP from true disaster. 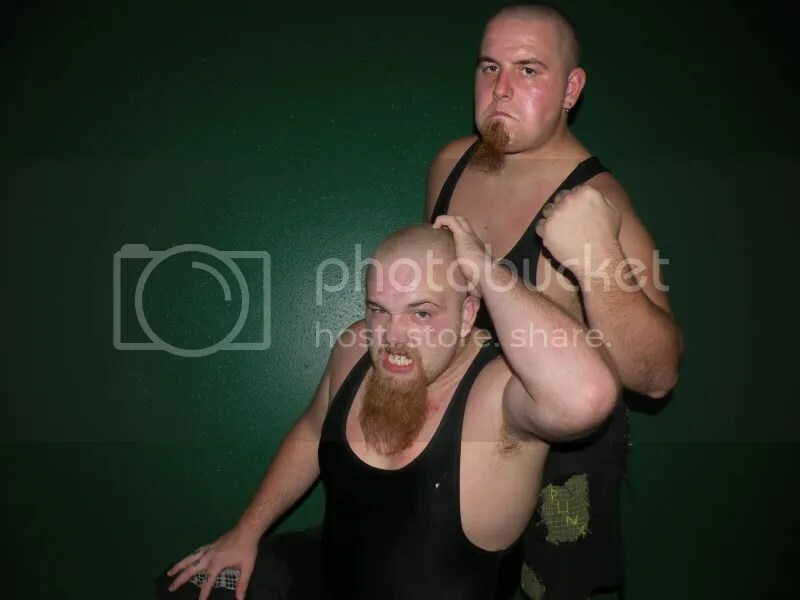 Chris Havius and Donnie Peppercricket would not only dismantle the Murder Militia and not once but twice but become a two time PWP Tag team champions before dissension arose tearing apart their team. 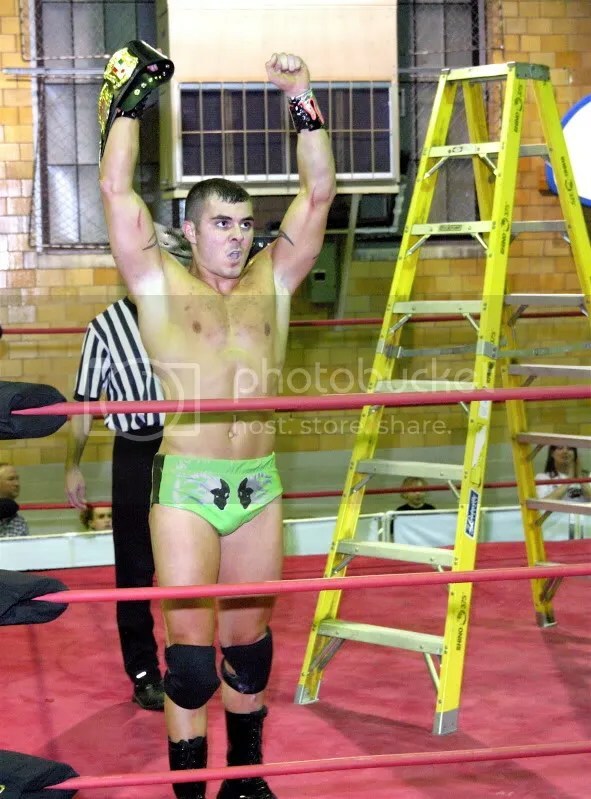 Results from PWP‘s Year of the Phoenix VI – NEW PWP CHAMPION!! ﻿Fans, you had to be there to witness an incredible night of action on January 15, 2011 as we kicked off the new year with Year Of The Phoenix 6! Shocking events took place and we will do our best to put it into words for anyone who missed it! The night featured an 8 man tournament in which the PWP Heavyweight Championship was being defended throughout! At the beginning of the night, all 8 tournament competitors made their way to the ring for a group photo and to announce the tournament brackets. After that, we got underway with the action. *** Tournament Quarterfinal: Matty Star defeated Abu Colossus. You could see the look of pain on Star’s face when it was announced his first round opponent was “The Big Hurt”. This was a phenomenal opening contest with Star doing everything he could to bring the big man down! Star nailed a lionsault off the ropes and caught Colossus off guard just long enough to score the 3 count! Abu shook Matty’s hand after the match. *** Tournament Quarterfinal: Preston Maxwell defeated Derek Cornell. Cornell, one half of the Beautiful Bodies with Brian Gott, had to go at it solo this evening in hopes of winning the tournament. Maxwell wanted nothing to do with Cornell’s antics, and quickly brought him down with the Gator Roll Choke. *** Tournament Quarterfinal: “The Rebel” Jeremy Wyatt defeated Zach Thompson. Zach Thompson was on the microphone insulting the fans in that signature irritating voice when Wyatt’s music hit, much to the fans relief. “The Rebel” has been showing a new focus lately, forgetting his former teammates and setting his sights on competing. 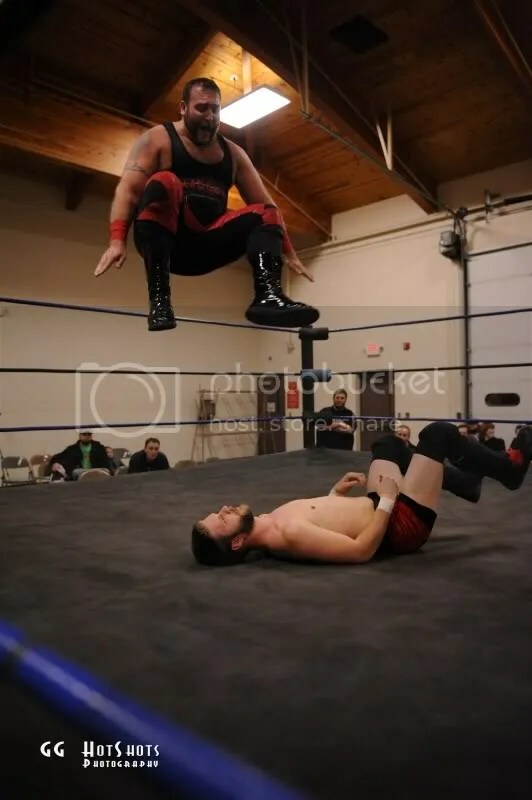 Thompson showed the fans of PWP a lot in this one, however Wyatt hit a devastating combo, a Superplex then floating over into a Fisherman’s Buster that got him the pinfall win and advancement in the tournament. *** Tournament Quarterfinal & PWP Heavyweight Championship Match: “Babyface” Tony Cortez defeated Joey Daniels. Joey Daniels seemed confident coming out, however Cortez took it right to him, holding nothing back. 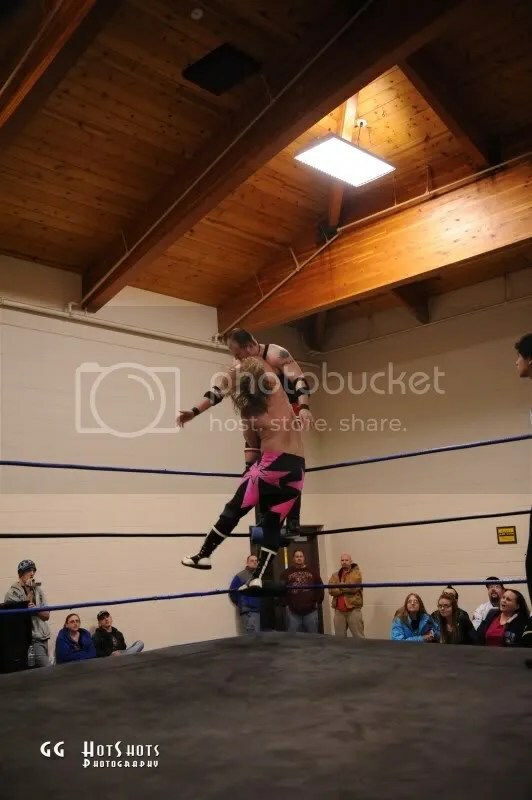 Daniels surprised a lot of people here with a few very close falls and almost became PWP Champion, however in the end the “Icon” of PWP nailed a back-drop driver to retain his coveted title. *** PWP Tag Team Championship: Zac James & Ryan Slade defeated Jimmy Rockwell & Mad Dog McDowell. Zac & Slade came out and explained their manager Axel Greece couldn’t be there however they would still defend their championship against anyone in the back. Jimmy Rockwell came out but Slade commented how he didn’t have a partner therefore couldn’t compete. Rockwell then brought out a surprise partner, the massive Mad Dog McDowell, and Zac & Slade did not look happy to see him! Mad Dog manhandled the tag champs for a bit until they got the upper hand on Rockwell. Zac, using every opportunity available, grabbed the Canadian flag and attempted to use it. When the referee took it away and set it aside, Zac used the distraction to nail Mad Dog with a low blow then he and Slade hit their Sliced Bread Splash combination finisher to retain their title belts. *** Tournament Semifinal Match: Matty Star defeated Preston Maxwell. Both of these men could taste the finals so bad that they refused to back down. Maxwell tried to lock his choke hold on to no avail. Star hit his incredible top rope Falcon Arrow maneuver to get the three count and advance to the tournament finals! What happened next was absolutely shocking. 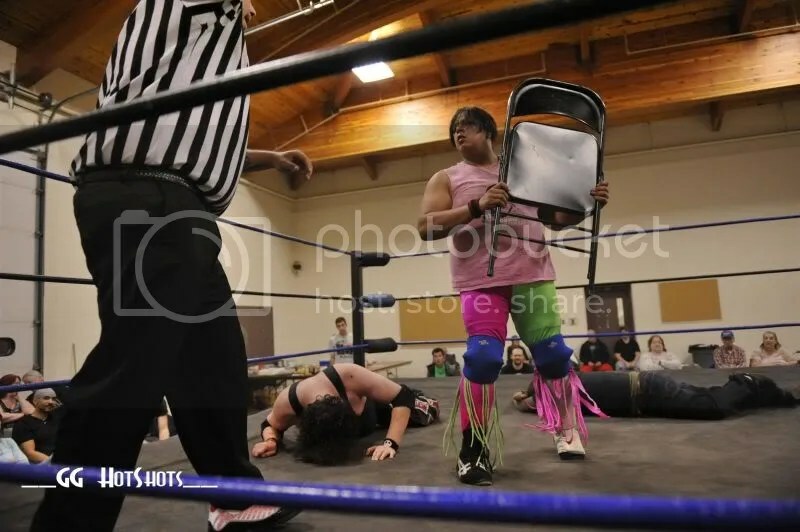 Maxwell attacked Matty, then grabbed a pair of steel chairs. He shoved Star’s head inside one chair and slammed the other chair onto it! Maxwell then locked his Gator Roll Choke onto Matty and refused to let go. After 2 referees and a few competitors finally broke the hold, Maxwell went to the back. Star was helped to the back but the situation looked bleak. *** Tournament Semifinal Match & PWP Heavyweight Championship Match: “Babyface” Tony Cortez defeated “The Rebel” Jeremy Wyatt. It’s the first event of 2011 and already we have a match of the year contender! You had to be there to see these guys take it to another level. They have battled before but this time they put it all on the line. Wyatt, a former champion put everything he had into it, but in the end Cortez rolled through on a high cross-body to win the match and advance to the finals! *** David Clark defeated Branden Juarez. 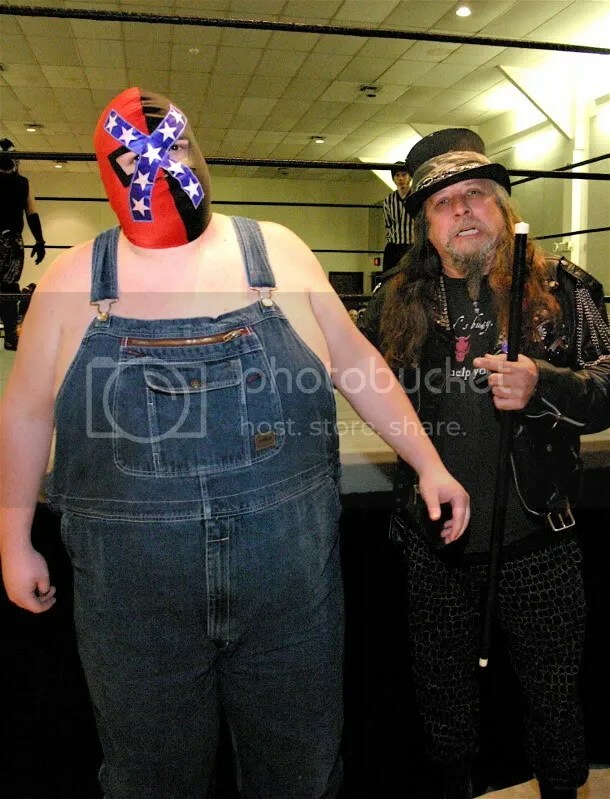 Clark came out for a match however during his entrance was jumped by the man formerly known as Donnie Peppercricket! Now we know he is named Branden Juarez and he claimed he served his suspension and still wasn’t booked, and was therefore “booking himself“! He grabbed a referee and demanded he ring the bell, and proceeded to beat on David Clark. 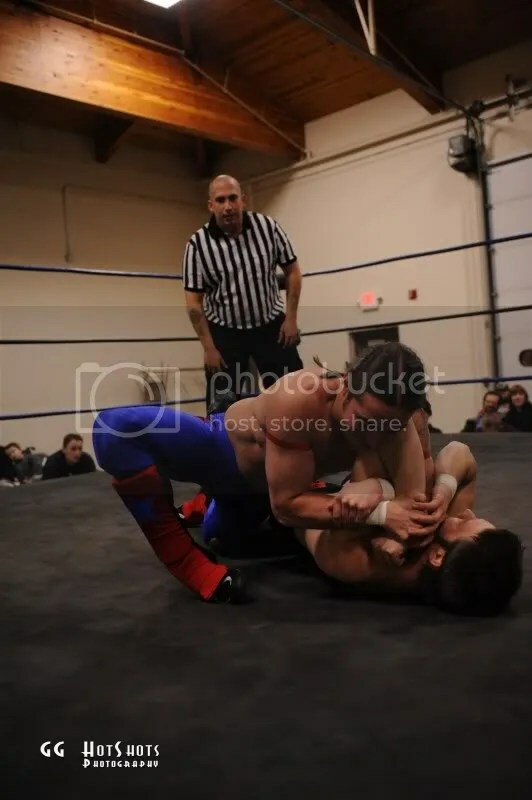 Clark came back strong including a HUGE T-Bone Suplex however Juarez hit the Kryptonite Crunch and pinned David… until he pulled him up. Juarez delivered more punishment and set up another finishing maneuver when Chris Havius’ music hit the sound system! This distracted Juarez long enough for David Clark to roll Branden up and get the victory!! A furious Juarez had little time to react as Havius returned to PWP and immediately attacked him! He had the upper hand however Juarez bailed out of the ring before too much damage could be done. Havius then gave an emotional speech and challenged his former partner Juarez for February 12th! *** PWP Heavyweight Championship Match: Preston Maxwell defeated “Babyface” Tony Cortez to win the Pro Wrestling Phoenix Heavyweight Championship! Matty Star’s music was played, but no one was sure what was going to happen. Preston Maxwell came out and very arrogantly explained that due to his attack, Star couldn’t compete. He then asked Tony if he was a fighting champion and when Tony said yes, he challenged him to put the title on the line against him right there and then. Cortez of course instantly agreed, never one to turn down a challenge. However, the evening had taken its toll on him. His second title reign that began on December 19, 2009 ended on January 15, 2011 when Maxwell locked in the Gator Roll Choke and Cortez passed out. 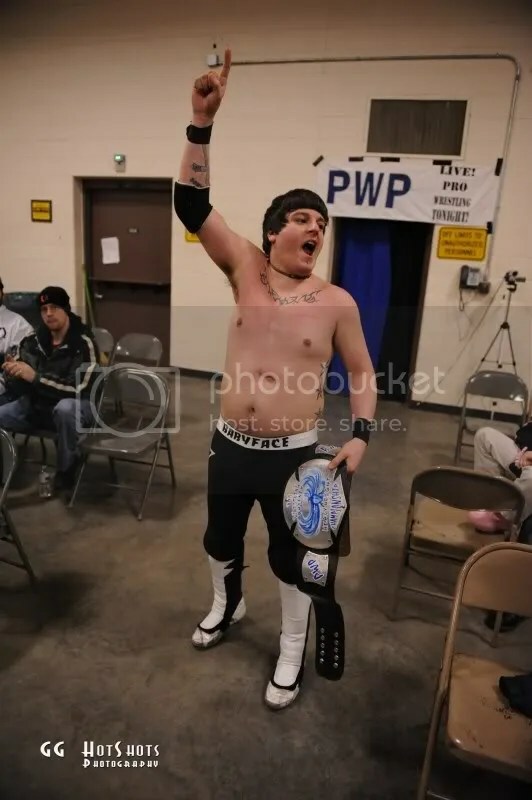 Maxwell then made PWP Staff put the belt around his waist and repeatedly announce him as the new champion. No one could have predicted the events of the evening. This is why you always have to be at PWP to see what could happen! The next event is February 12th at the Council Bluffs National Guard Armory! Tickets as always are $10 and the doors open at 6:30, bell time 7:00! *Preston Maxwell will defend his PWP Heavyweight Championship. Who he will defend against is unclear at this point. There have already been people demanding a title shot against him, and we will know more soon. *Chris Havius will take on Branden Juarez one on one! These former Tag Team Champions, now bitter rivals will beat the crap out of each other, that is for sure! Be there to see Havius attempt revenge! More details will be announced soon, thanks to all our great fans! 2011 will truly be the year of Pro Wrestling Phoenix! MWR Christmas wish list of matches for 2011. 2010 is near a close and the yearly awards are coming up quickly with some very tough decisions to be made from the awards committee over who will honored with the Wrestler, Tag Team, female, and promotion of the year. So instead of worrying about who I am going to give my vote to I am going to flip the script. I am going to make my Christmas wish of matches on this Black Friday that I would like to see in 2011. Instead of matches that have done before I am going to do my best to name 10 matches that to my knowledge have not happen before. So without further ado I give you my Christmas wish matches in NO certain order. – It is no secret that I have mad respect for both of these competitors. These two men going at it would be a true wrestling classic. One could say that Mannix has the power advantage but Strife could be just a little faster. Neither man is afraid to get their hands dirty and brawl with the best of them. A true wrestling classic in every aspect. 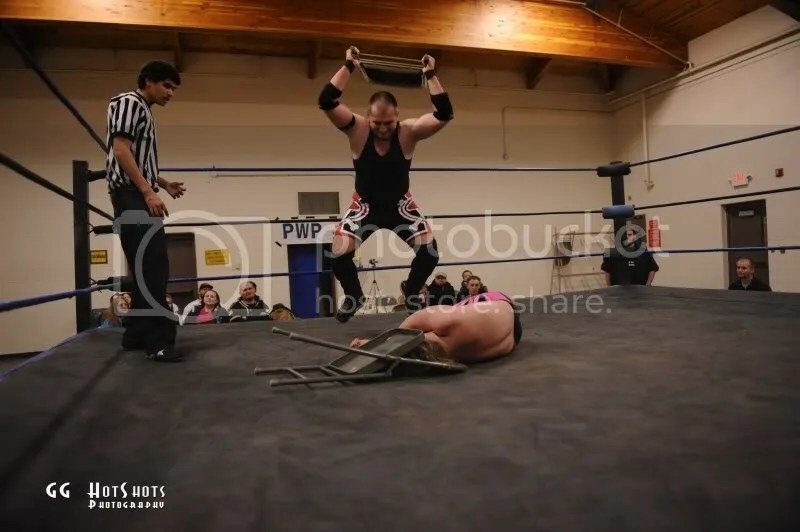 Attitude Inc. (Guy Smith and Michael Shard) – Can New Midwest Wrestling handle being EXTREME? 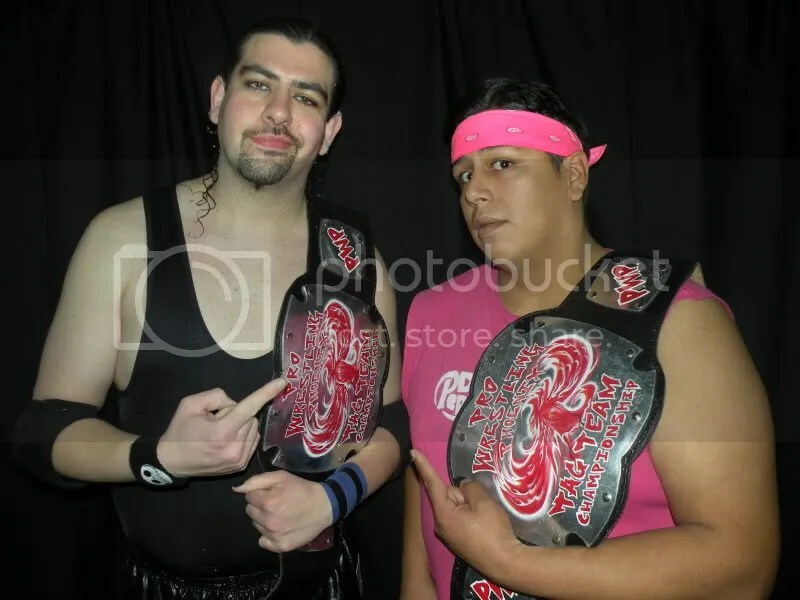 Former ECW Original Angel and his partner Domino Rivera is two men that many promotions run and hide from signing them to the fed. Attitude Inc appears to be all show but the Boyz would soon find out that Guy Smith and Michael Shard can go. Shane Rich – The beauty and the Beast is what I would call this AAPW clash. Rich has the good looks and conditioning but would it be enough to overcome the hillbilly power of the Destroyer. Mephisto feels the power of Donovan Ruddick. – OK I have been begging for this match for a long time now. Don’t believe me click here to read a former article of mine that sets this match up perfectly. With Ruddick on the verge to explode would Colossus put out the spark first. The Gentleman’s Club (Casanova and Devin Carter) with Todd Countryman. – The Hooligans have been almost everywhere but they have not been to the 2008 MWR Promotion of the Year 3XWrestling. With the Gentleman’s club running hot shot over everyone would the Hooligans be able to sway the good fortunes over fan favorites? Or would the mastermind Todd Countryman make them his next victim. Lucy Mendez has come on strong in 2010. Santana has teamed with some top talent in 2010 but she has yet to win the WLW Womens title. – Two of the most popular women in the Midwest today. Mendez has had all the eyes on her at Metro Pro Wrestling. What if the Midwest Sweetheart was to show up? No women I know wants competition and the real winners in this battle would be us the fans. To become the best that you can be you have to work your way to the top. Money the teenage heart throb has had a solid year in 2010. Wyatt is considered by many to be the best in the game today. You say Money has no chance to survive against “The Rebel”. In Money’s defense he has earned some tough wins but this would be a measuring stick for one of the Midwest hottest young stars. 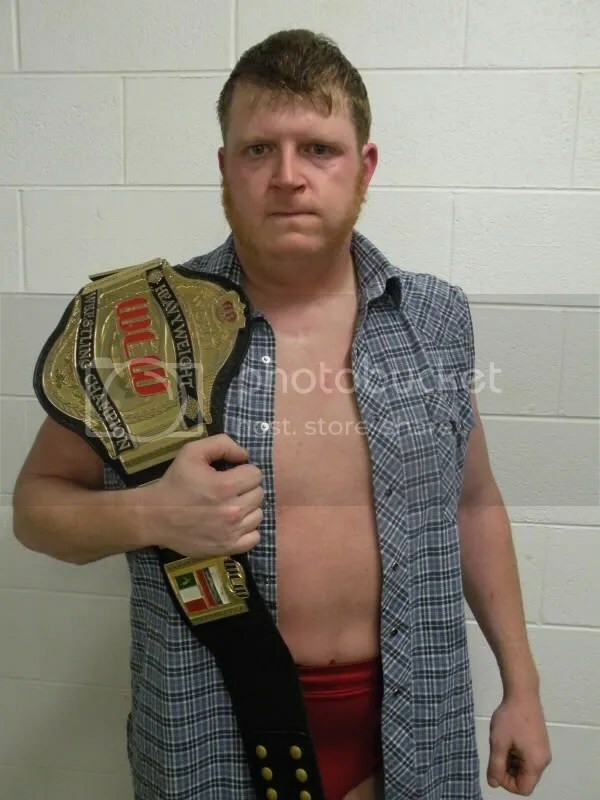 My advice Money, if you have a belt stay far away from “The Belt Collector” Jeremy Wyatt. -MTV vs MTV – Rory Fox gained national fame as one of the featured personalities on MTV’s True Life while Dan the Danimal” Walsh starred in MTV’s Road Rules. Need I say more. 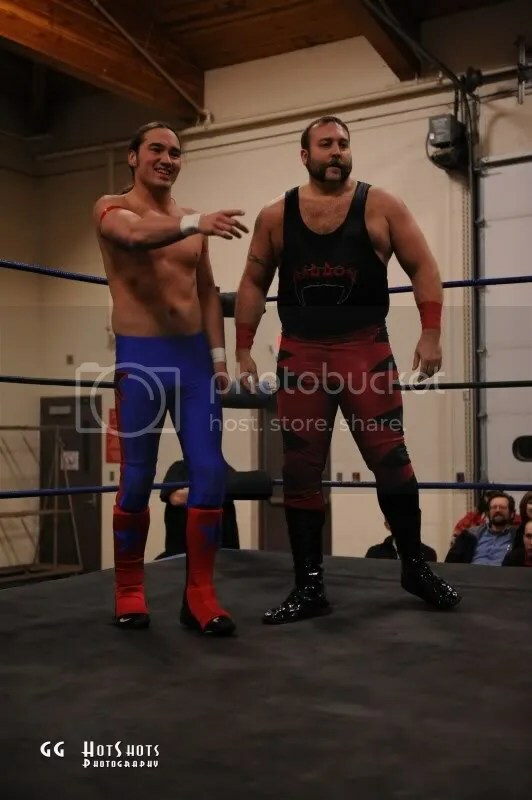 – Different styles for sure, Fender and Sterling are no nonsense hit you in the mouth tag team in the style of Arn Anderson and Tully Blanchard while BroMance is….well they are BroMance a team with a lot of flash but can blind you with their double team abilities. 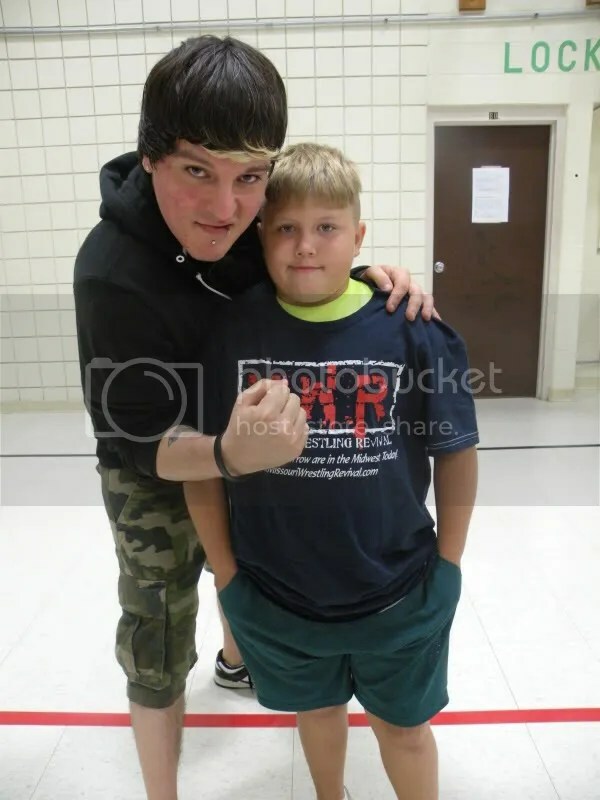 Jonathan Magnus with Stephani King- No one likes a bully and that is what Magnus is at New Midwest Wrestling. A big man pushing his weight around to keep the NMW title around his waist. I don’t think that Murdoch would be so easy to push around. A match that would be talked about for ages in Springfield Illinois for years to come. Crimefighter’s chosen wrestler vs. The Pride of Peroia Eric Allen – A perfect match for NMW. 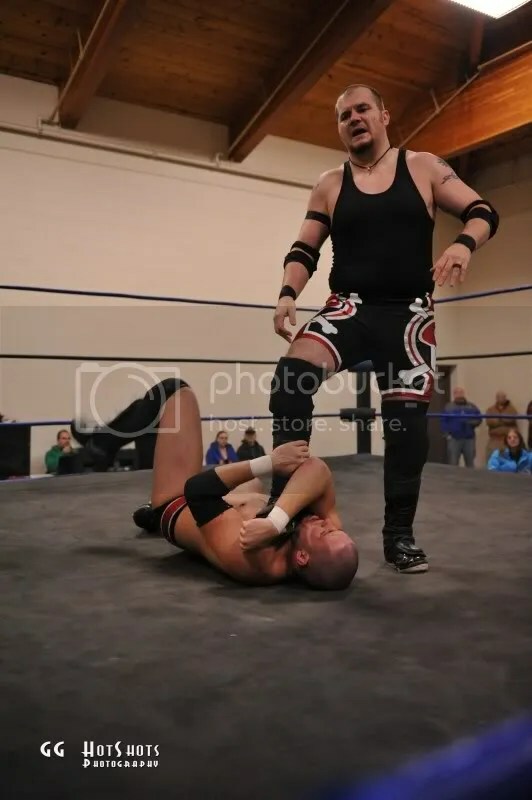 It has been over a year ago that we took a look at the contriversal Eric Allen and his supposed win for the “Peorian Pride Championship”, ST louis Wrestling communities Crimefighter called foul quickly. Words and tempers flared between the two in the past but what if the red hot Eric Allen was to show his face in Springfield Illinois at the heart of Crimefighter’s coverage area? A special attraction match for sure. At the beginning of the show, PWP Tag Team Champions Zac James & Ryan Slade came out along with “Manager Supreme” Axel Greece. 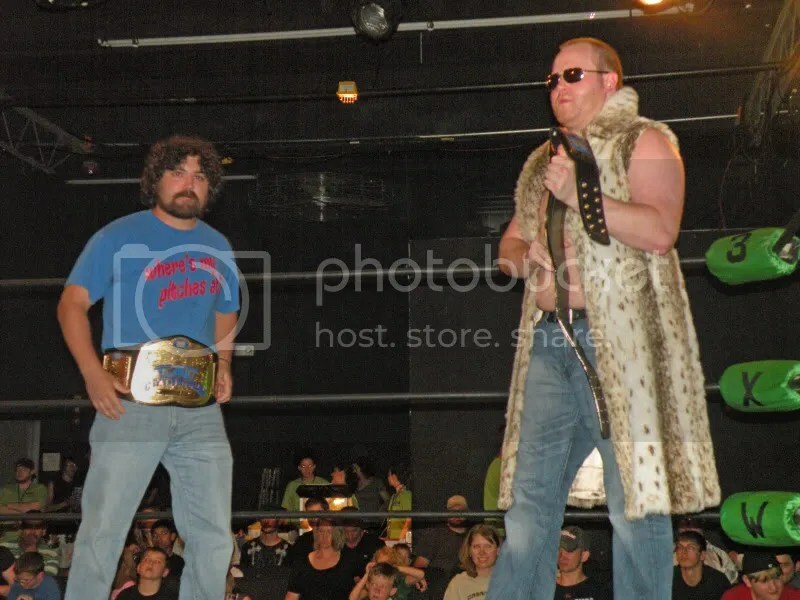 Greece explained that if Chris Havius & Donnie Peppercricket lost, they could never have another tag team title shot as long as James & Slade were champions. However if they won they would get Greece in the ring for five minutes after the match. They made fun of the crowd for a few minutes before Chris Havius & Donnie Peppercricket came out. They chased them out of the ring, and Chris Havius told them to up the stakes a little bit. He made the challenge to make the match a Tornado Tag match, which the Champions accepted! 1.) Sir Bradley Charles defeated Jayden Draigo. This was a very technical opening bout, and Draigo didn’t seem like his usual self. In the end, SBC got what most would consider and upset win over Draigo with his TKO maneuver. 2.) 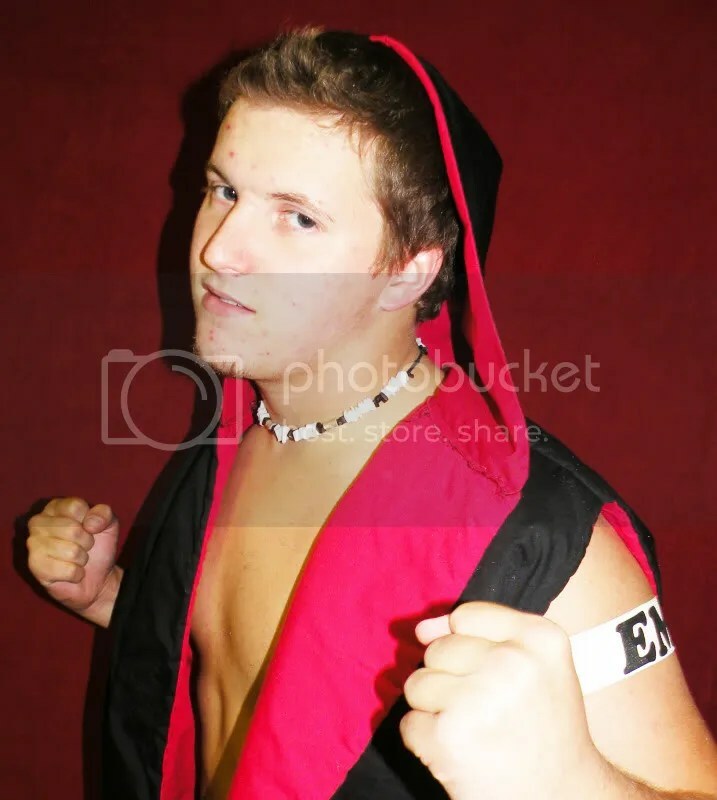 “The Rockstar” Jimmy Rockwell defeated Zach Thompson. You could tell that each man was familiar with the other’s work as there were reversals all over the place. In the end Rockwell laid out Thompson with the sit out Gordbuster and hit his Rock-On Bomb off the top rope to get the 1-2-3. 3.) Joey Daniels defeated David Clark. 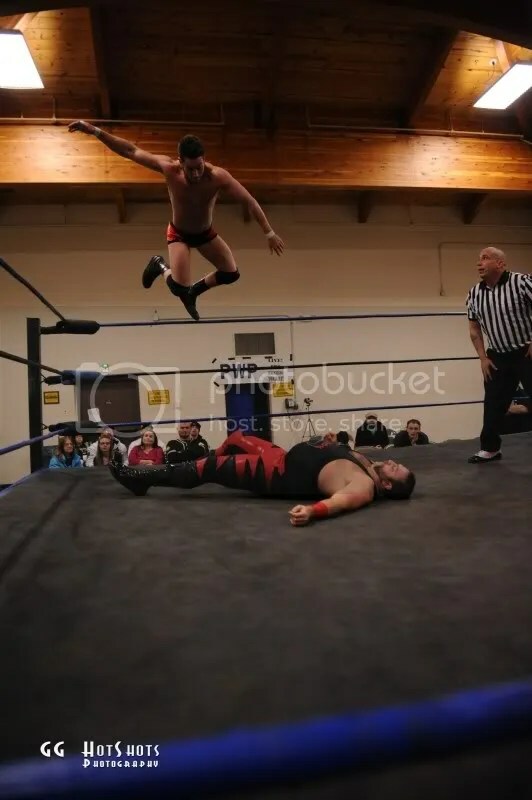 Clark, returning to the ring after a lengthy stay in China was looking to pick up where he left off by taking Joey Daniels out. There was a lot of action here, and Clark showed an amazing array of Suplexes and holds. However Daniels had his tricks up his sleeve as well, and capitalized on one small mistake Clark made to pick up the victory in this one. 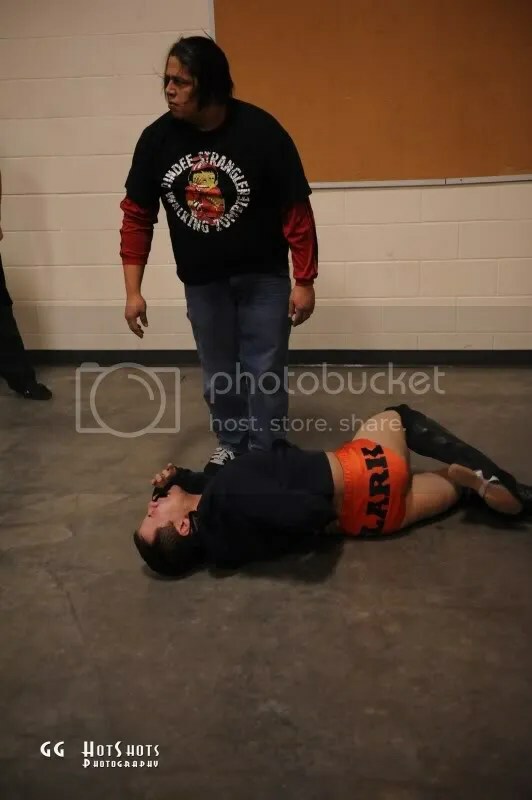 During the match, Jayden Draigo was observing from the entrance area, and afterwards, he got in the ring and whispered something in David Clark’s ear. We are not clear what the meaning of this is and are trying to get some more details. Clark declined comment on the matter. 4.) Abu Colossus defeated Preston Maxwell via Disqualification. Colossus was looking for revenge against Maxwell after last month’s mockery of the Big Hurt. However, during Colossus’ entrance, Maxwell sneak attacked him and they started brawling on the outside of the ring. They threw each other into walls and chairs as the referee tried to get them into the ring to start the match! Maxwell reversed a whip into the ring post and it seemed like Colossus was hurt. He rolled him into the ring and demanded the referee ring the bell but only got a two count. Some back and forth action between the two happened before Colossus set up for his big Full Nelson Slam, but Maxwell took the cheap way out by kicking him straight in the crotch! The referee rang the bell and Maxwell locked the Gator Roll Choke on Abu, refusing to let go. It took two referees and about 5 minutes before Maxwell finally let Colossus out of the hold and you could tell he was very proud of himself as he went to the locker room. 5.) Zac James & Ryan Slade w/ Axel Greece defeated Chris Havius & Donnie Peppercricket to retain the PWP Tag Team Championship. 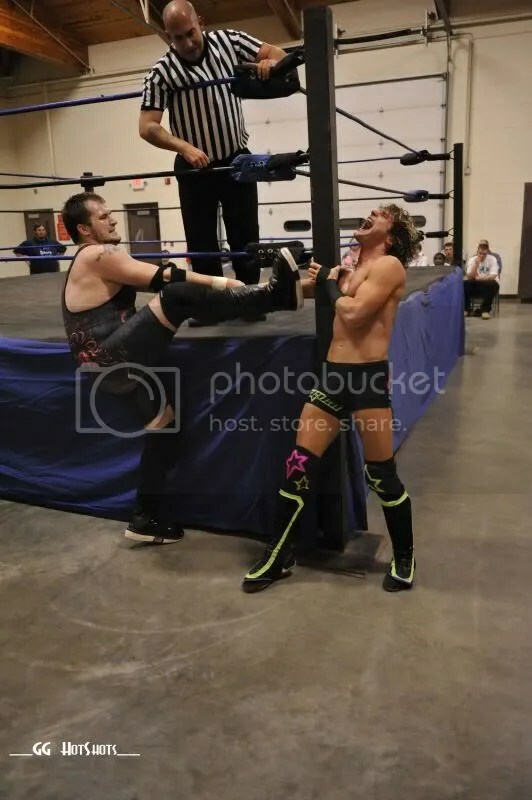 This match broke down fast with the Tornado rules in place, and it seemed that every time Havius tried to get in the ring to stop Peppercricket from getting double-teamed, they would knock him back outside. 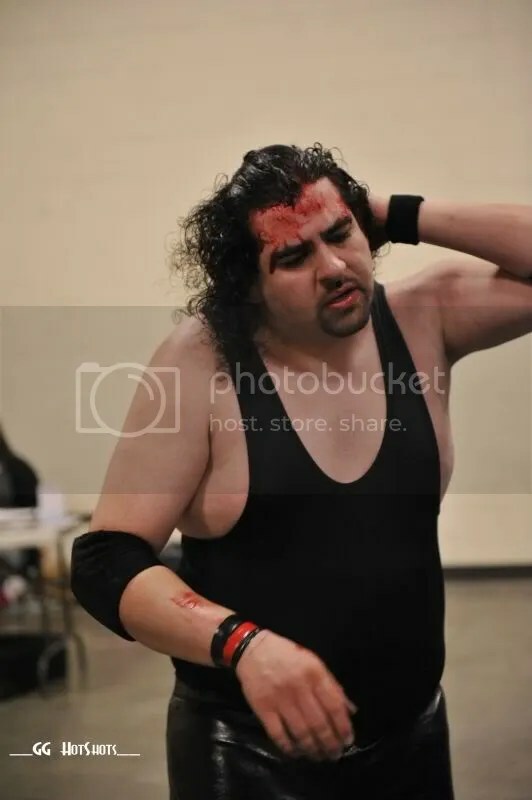 The end came when Slade whipped Havius into the ring post causing a deep laceration requiring stitches to close. Meanwhile James hit the Sliced Bread on Peppercricket, and Slade followed it up with a splash from the top rope to retain their titles and save their manager from a beating. Elated, the champions left knowing they will never have to face the duo again. What happened next was perhaps on of the most shocking moments in PWP history, as Donnie Peppercricket brutally attacked Chris Havius! He yelled that it was Havius’ fault, and hit him in the back multiple times with a steel chair! He then his Emerald Fusion maneuver onto the chair before leaving Havius lying in the middle of the ring. 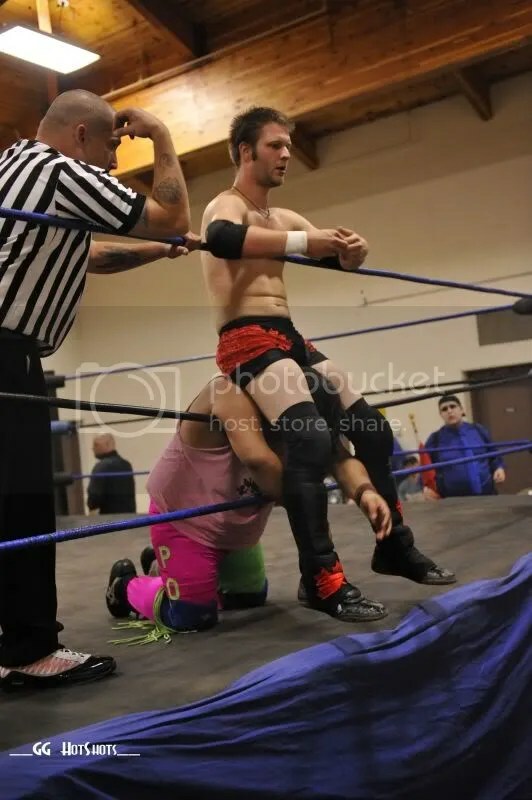 PWP Official Cody Murphy was in the ring immediately to check on Havius but his timing was too soon as Peppercricket, furious with rage returned to the ring and gave the Crew Member a Fire Thunder Driver! 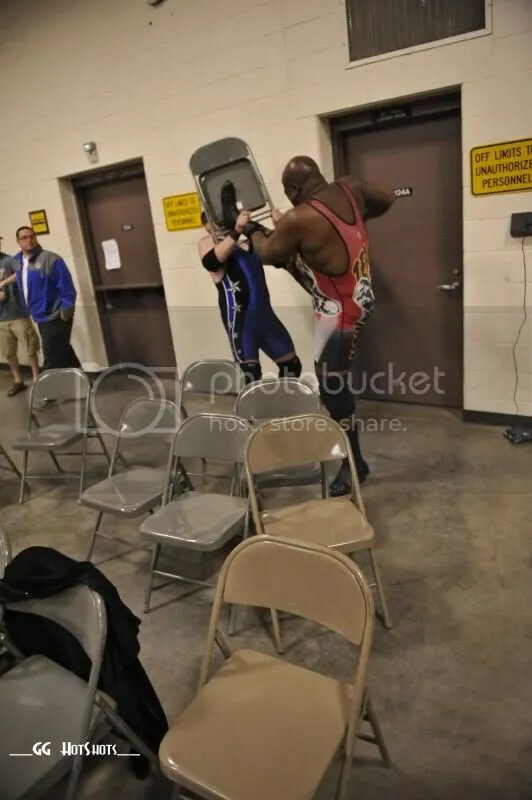 He then dragged Havius over the corner, put the chair on top of him and delivered a vicious Vader Bomb. 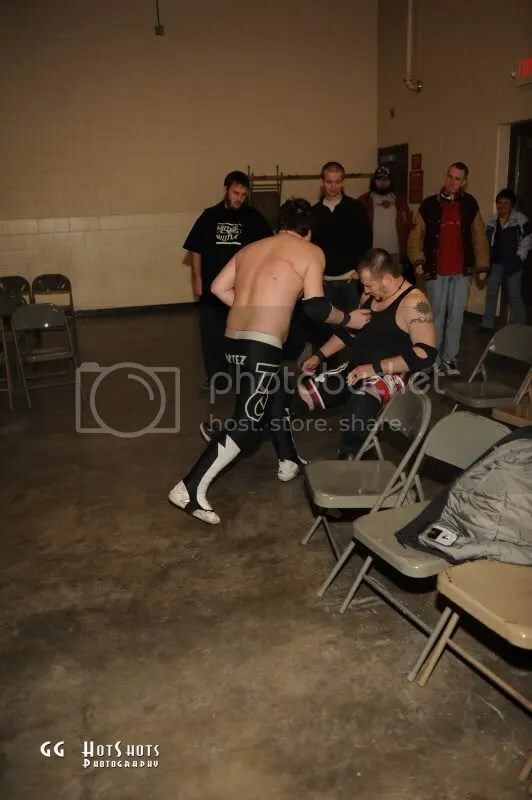 The crowd was shocked as Peppercricket taunted them and left out the front door, on his way out, he taunted Havius’ girlfriend who was practically in tears after witnessing the beatdown. PWP Referees and Crew Members helped the PWP Official and Chris Havius to the back once Peppercricket was out of the building. Abu Colossus came out, looking pretty upset at Preston Maxwell’s actions from earlier in the night, and he laid out a challenge for the show on November 13th. He challenged Preston Maxwell to PWP’s first ever Last Man Standing match! This is going to be brutal! 6.) 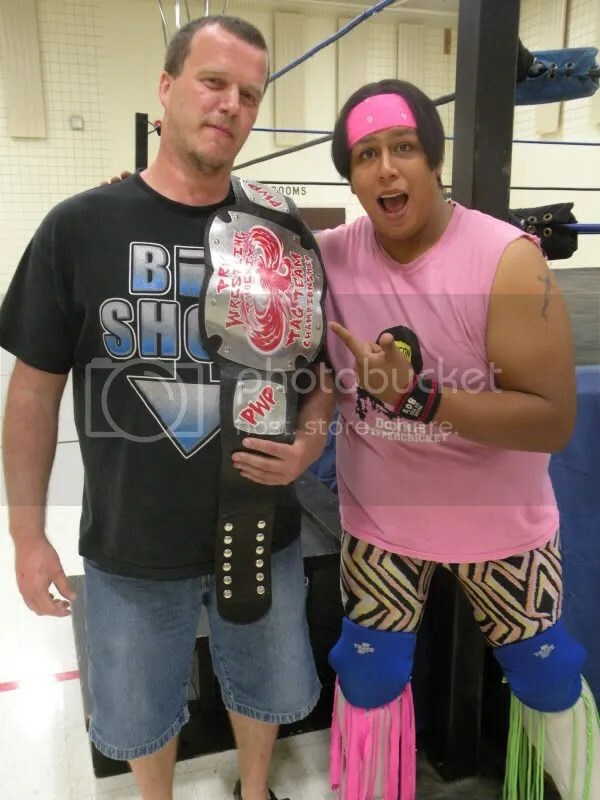 “Babyface” Tony Cortez defeated Matty Star to retain the PWP Heavyweight Championship. This was just an amazing contest, it’s hard to do it justice by just describing it! This match is the reason you need to be at PWP Live Events, the action was so intense between the two! 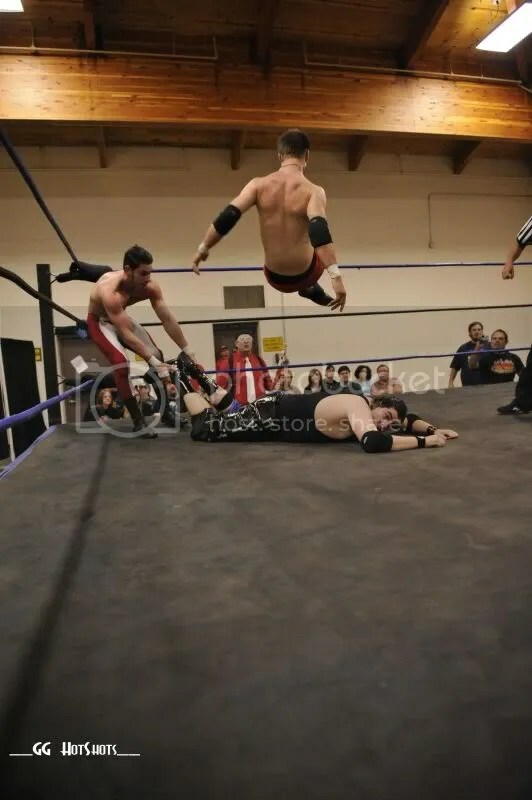 There were multiple times when either man could have been pinned, but a critical moment came when Star (and the crowd) thought he had the match won with a Falcon Arrow off the TOP rope! 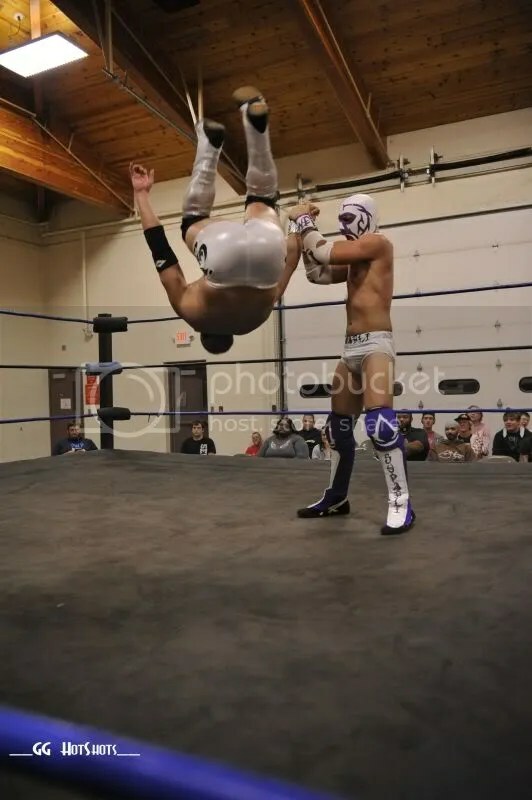 Somehow Cortez found the heart to kick out of the maneuver! 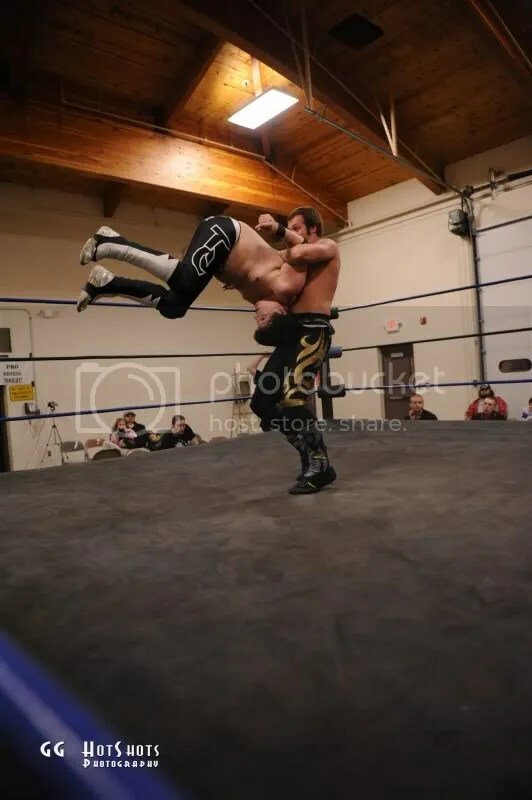 Star went up top one more time, but it was a mistake as Cortez was able to capitalize and deliver the Ki Krusher that he has been using to pin his opponents lately and retained his coveted title. After the match Cortez and Starr showed each other respect and you could see that Cortez deemed Star a worthy opponent. The match has been signed and it will happen! Next month’s main event will be the first ever Last Man Standing Match in PWP: Abu Colossus Vs. Preston Maxwell. If a challenger cannot get to his feet to answer a 10 count from the referee, than his opponent will be declared the winner! This is not just a matter of who is the better competitor but also a matter of pride for Colossus as he has little patience for the games that Maxwell likes to play. As a result of his heinous actions, Donnie Peppercricket has been fined a sum of $1000 and is suspended from competition for the duration of November. PWP Heavyweight Champion “Babyface” Tony Cortez will be defending his title against an opponent that will be named in the coming weeks! Thanks to all the fans who support us and we will see you on November 13th! 4 States, 14 Shows, 4,265 miles and 74 hours on the road in 3 months at MWR. With a plethora of great shows these past few months, it has been hard to keep up with all the exciting news flash, photos and happenings around the Midwest. MWR has been active with some of the top stars in the country while meeting many of you the great fans, some for the first time while others we know quite well. We have spent almost every weekend on the road covering the top promotions in the Midwest. Let’s take a look at some of the sights of the past few months with MWR, the Fans and Superstars around the Midwest. HVW returned from their summer break to with top stars Kahagas taking on Trent Stone , the Midwest Sweet heart Santana G going up against her arch rival Amy Hennig and the Great Cheyenne with MsChif watching. Would it be just by chance that the MWR Wrestler of the Week was MTV’S Dan Walsh who would give away a MWR T-Shirt in August only to see him get the HVW Livewire title soon after? Hey Dan we are just playing, you earned it….with a handful of Trent Stones tights. The trips to Iowa seem to take so long to get their, which has been a reason for us to scale back from going to PWP and 3XW. One problem they are so GOOD!! MWR fans don’t worry we have no plans what so ever to stop covering these two exciting promotions. 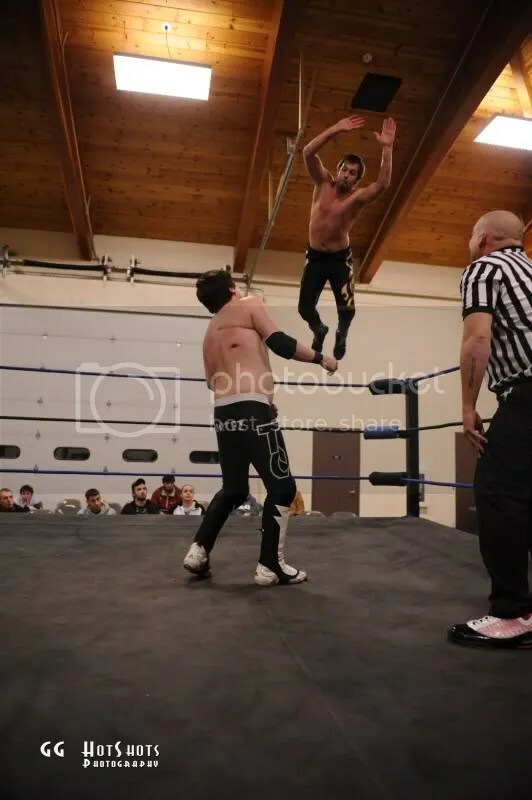 Pro Wrestling Phoenix delivered on this evening with some exciting wrestling action. We were on hand when Axel Greece assists Ryan Slade and Zac James cheat Chris Havius and Donnie Peppercricket out of the PWP Tag Titles. The show also saw the war rage on between Abu Colossus and Preston Maxwell. The MWR Wrestler of the Night was the PWP Champion Tony Cortez. Cortez was able to survive the onslaught on Jayden Draigo to retain the championship in a feud that has become quite personal. The Balloon festival in Lincoln Illionis is a BIG deal and with PWE providing a FREE show if you attend you can not miss it. 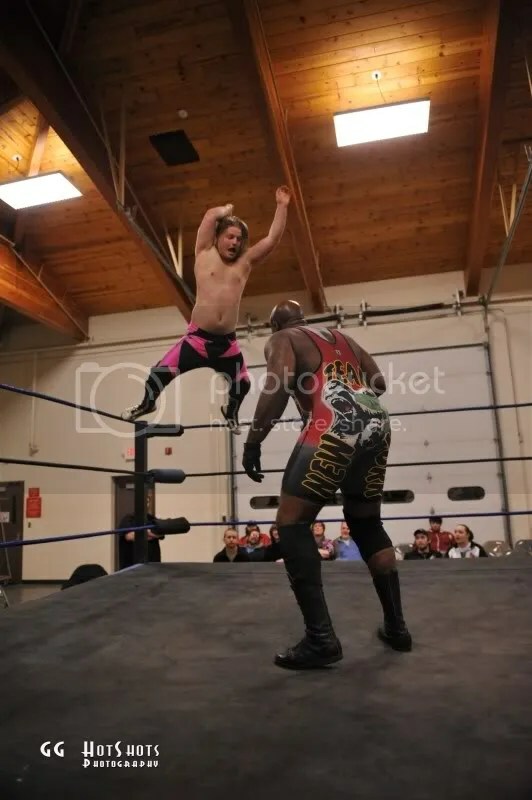 PWE delivered with the biggest match in years in the Midwest literally when the PWE title was on the line between the Mississippi Madman taking on “The Future” Donovan Ruddick led by MR Late Nite. Ohhhs and AHHHS were heard as the two behemoths battle for supermecy and who is truly the top big man. Nothing was settled decisively, but the crowd went home to tell their friends about the Madman and Future. The match that shook the Midwest . “The Kid” Evan Money was the MWR Wrestler of the Week as he went on to defeat Eric Allen with a frog splash. We were thrilled to support Metro Pro Wrestling for several reasons; first off the wrestling scene in the KC market has been dry for some time now. With Metro Pro Sports having TV, showcasing several of the top stars in the country today and oh yeah our former partner in crime Josh Ray is the current ring announcer for this upstart promotion. 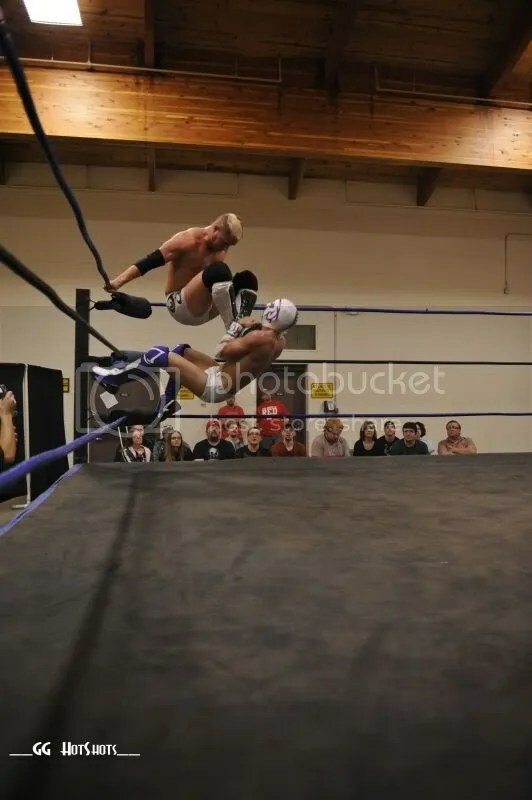 Metro Pro proved to be a great time with a great upside going into 2010. Our first trip to Olney lived up to the hype that has been told to me. A weekly FREE Wednesday show how can you go wrong. A great small venue filled with some of the top young talent in the area. Everyone that I talked to loved the stars of IWA U and looked forward to the hump day of the week. If you have the day off and live in STL I urge you to take the drive to see what you are missing. A great day for the community of Hillsdale as MMWA-SICW teamed up with the Hillsdale Police force to provide a free wrestling show. MMWA-SICW are always fan friendly and if a free outdoor show was not enough, the team work also offered free BBQ and back packs filled with treats from the police force given to them by the stars of MMWA-SICW. 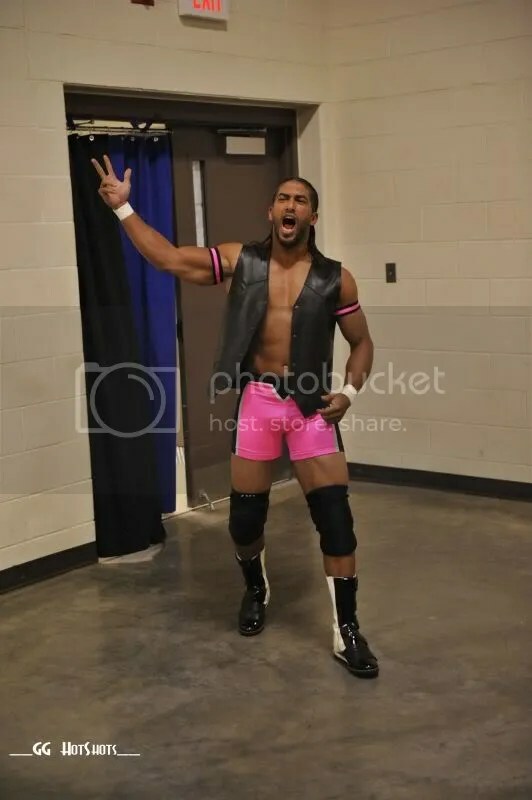 The MWR Wrestler of the day was none other than Ace Hawkins. 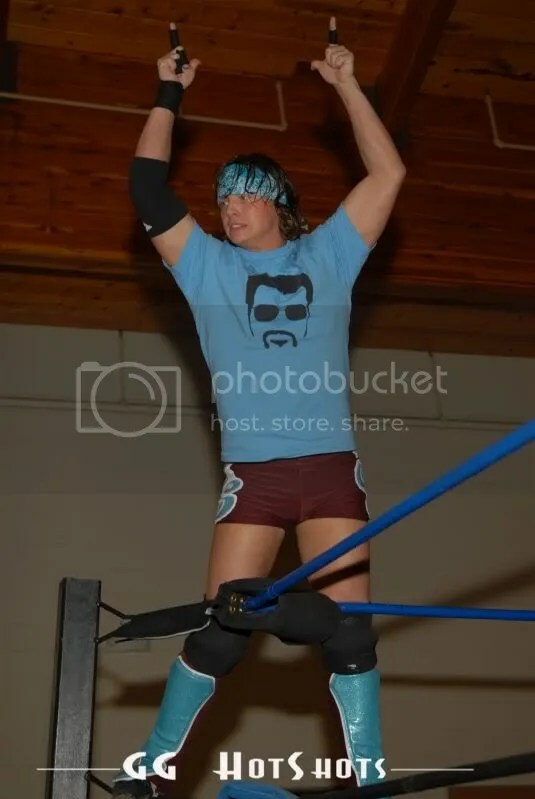 Ace fresh off of his appearance at Ring of Honor not only gave away a free MWR shirt but bicycles from the kids and some awesome ST Louis Wrestling Hall of Fame shirts before having a great match against Brandon Espinosa. One of the best kept secrets in the Midwest, is the fact that some of the best talent in Iowa makes the long trip to the STL to go to prove that they are among the best in the Midwest. 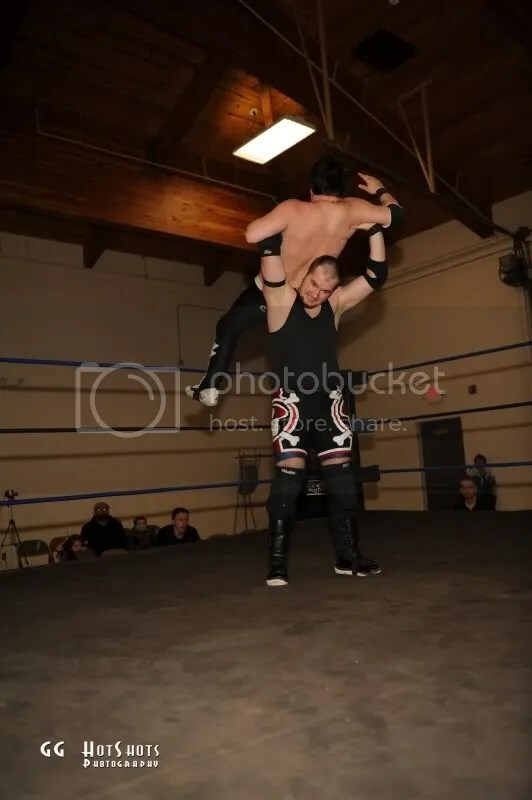 Jimmy Rockwell, Devin Carter, Zach Thompson, Ryan Slade and even self proclaimed wrestling genius Chad Mylan has put an end to Gabriel Brimstones stranglehold in the Independent title when his man Kwong won the belt in recent months. 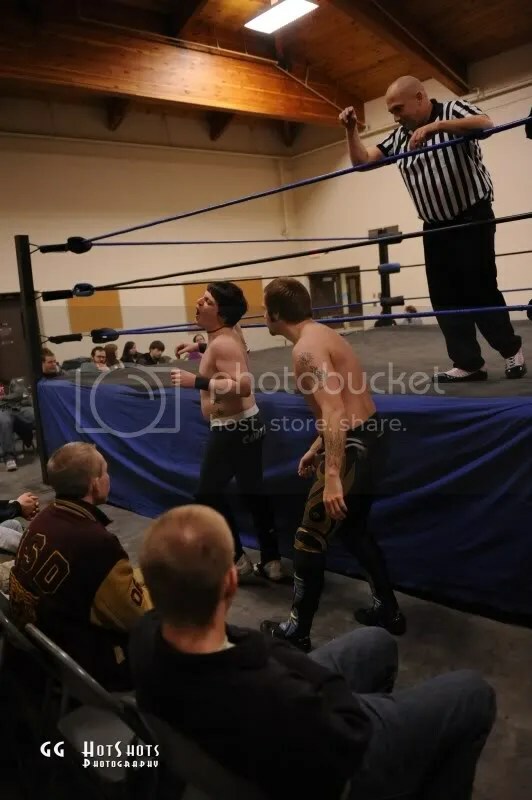 Iowa is not the only area that is well represented as the upstate Illinois wrestlers BroMance (Knight Wagner and Jordan McEntrye) with Erin currently holds onto the MECW Tag Championship and Matt Mayday, Mike Anthony and Chris Logan have all brought their own flavor in the company. On this night the MWR Wrestler of the Night was the champ himself, Bailey Mannix. Mannix is still one of the most underrated wrestlers in the game today. Metro Pro Wrestling heated up with the brand new Metro Pro Wrestling TV Champion Trevor Murdoch taking charge. With an appearance from wrestling great Harley Race the fans where able to see some of the great from the past mixed in with some of the best today. If fans in Kansas City want the best bang for their buck they need to give Metro Pro Wrestling a chance. You won’t regret it. One of the biggest nights of the year brought several of the most influential men in the game today. 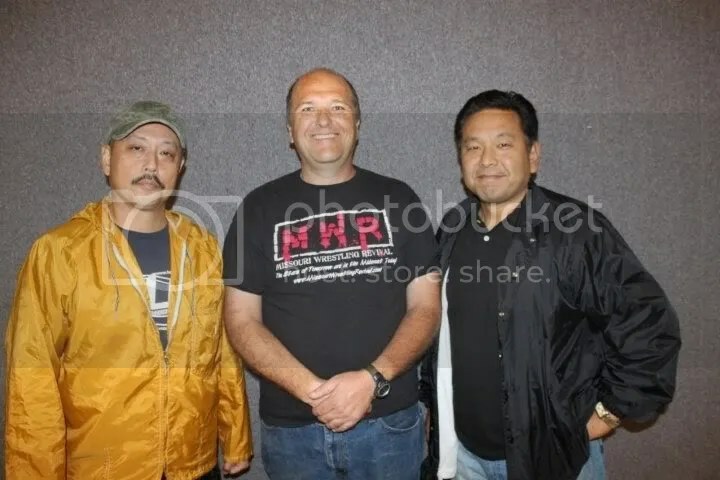 Co-Owner of Pro Wrestling Noah was in attendance along with Harley Race and Cauliflower Alley Club’s Karl Lauer. The MWR Wrestler of the Night was Midwest knockout Lucy Mendez who gave away the very first MWR pink t-shirt. Wrestlers from around the world took the week long camp in hopes of making it to the show. Just down the road from my house was a new promotion was a rare Sunday show that featured local favorite The Iceman. 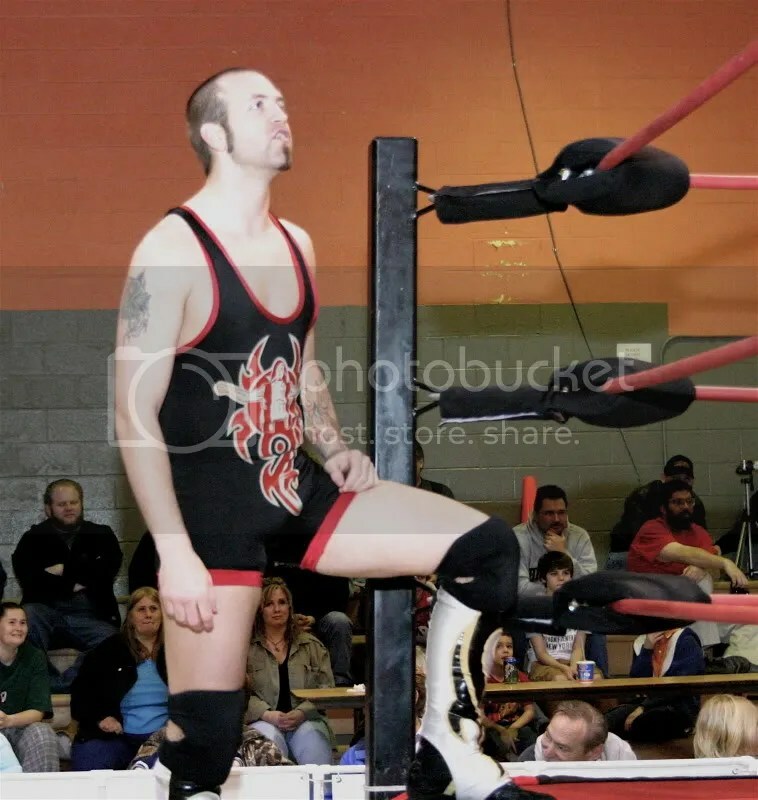 Brian Blade won the belt at the very first show and has been a thorn in promoter Dustin Watson’s side ever since. We were on hand to present the High Voltage Wrestling tag champs the Hooligans the 2009 MWR Tag team of the Year plaques. To be honest we offered the exciting tag team Full Contact Dojo (Jonathan Gresham and Ric King) the chance to be the MWR Wrestlers of the Week to throw out a t-shirt as a way of being nice. In a shocking development they defeated The Hooligans to become the NEW HVW Tag Championship . 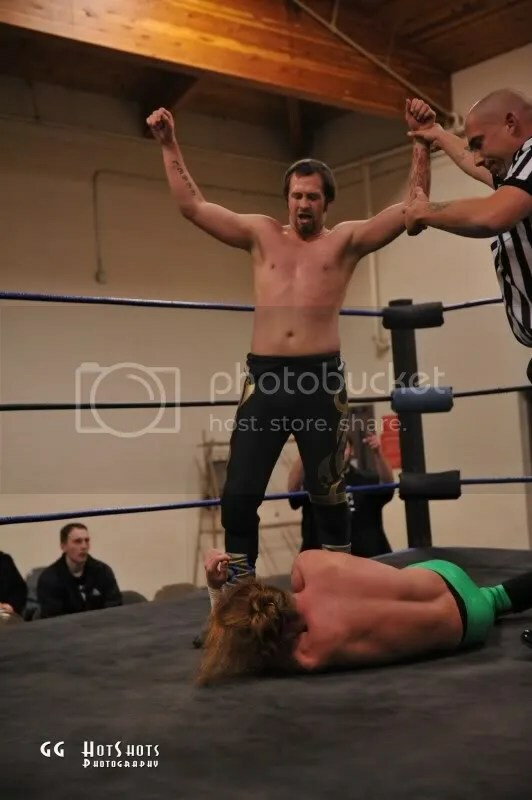 No HVW Champion was safe as “The Belt Collector” Jeremy Wyatt defeated Kahagas and Dan Walsh won the HVW Livewire belt. Look for a photo recap as well and interviews with all of the new HVW Champions here at MWR in the future. NMW invited us and invited us and I am glad that they did, we had debut once before and was very impressed and happy to have added them in our NMW Coverage area. 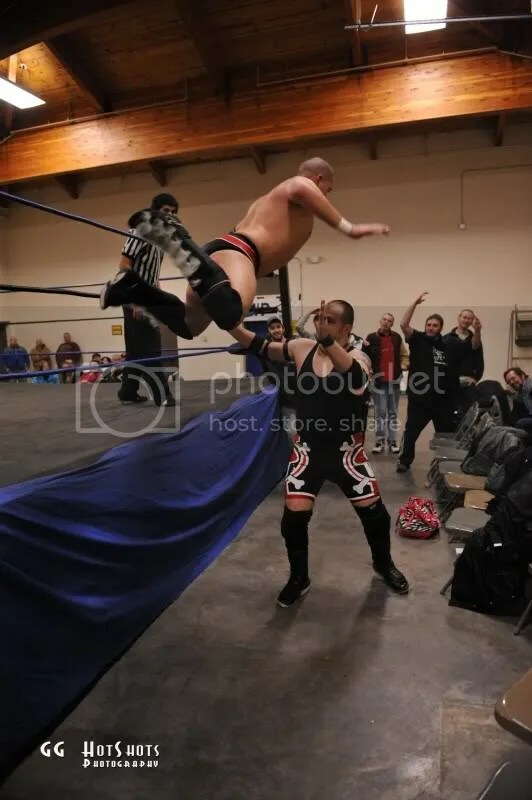 The last show I photographed the most dangerous ( and fun matches) to be a photographer at in my carrer during the4 team NMW Tag Team scramble match and returned for the biggest Battle Royal, rumble style of the year for NMW. All for the enjoyment of you the fans. The MWR Wrestler of the Week was up and comer Christian Rose. Look for more information about this exciting night of wrestling at MWR soon. There you have MWR fans, the itinerary of where Dubray and I have been in just the past tthree months. 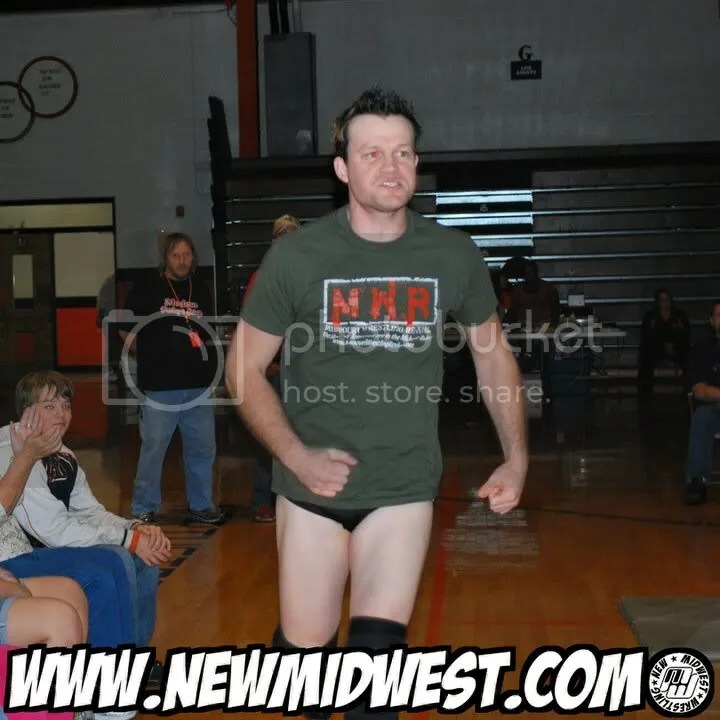 We may not be able to keep up with the miles that the 2009 MWR Wrestler of the Year Mark Sterling does but who can, that man is a machine. 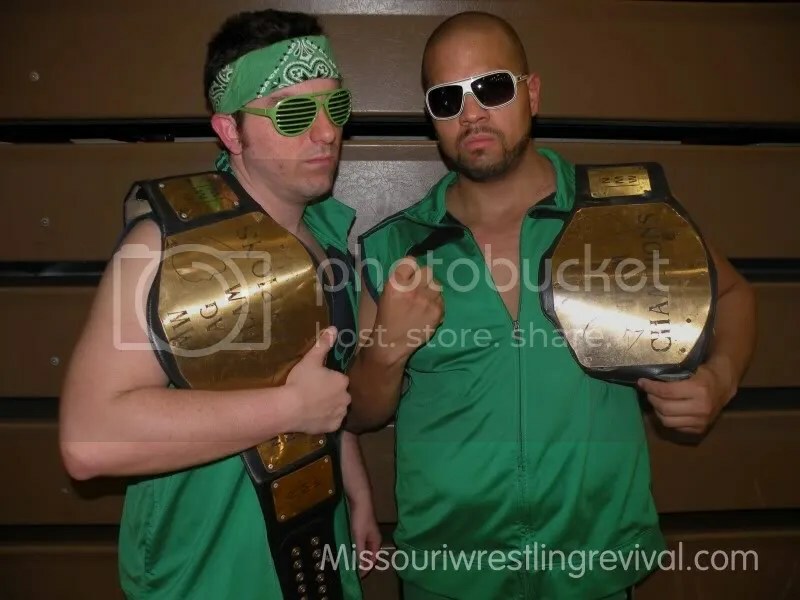 Missouri Wrestling Revival – The Wrestling Press of the Midwest. MWR fans please support your local professional wrestling and we hope to see you at a show. 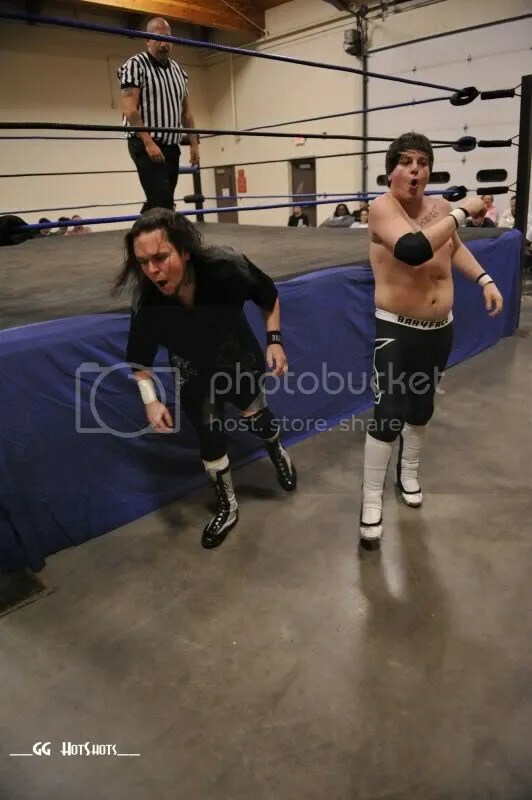 At the beginning of the show, Jayden Draigo came out and once more berated the fans and called “Babyface” Tony Cortez out to hear him out. Once Draigo put his hands on the PWP Heavyweight Championship, Cortez slapped him and left the ring. 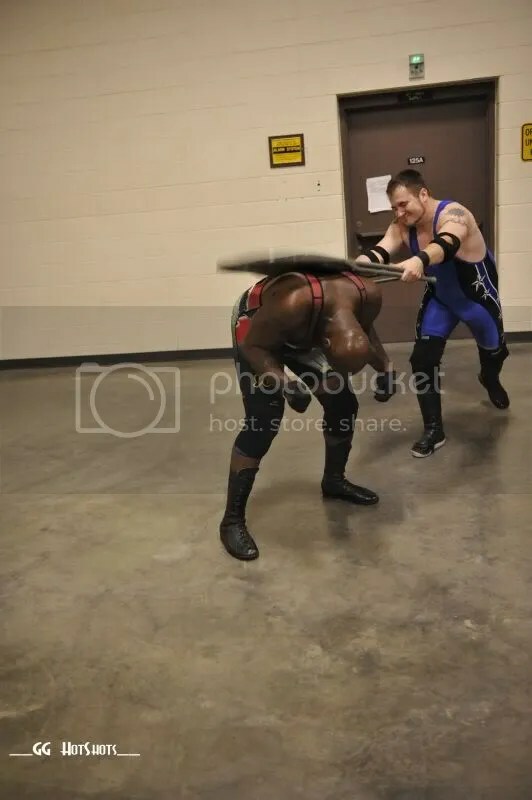 As he was exiting, Draigo grabbed his Kendo Stick and swung at Cortez, only to have him catch the stick and take it with him to the back! #1 Brett Young came out and issued a #1 Shot Challenge to anyone in the building. Out came Matty Starr much to the fans delight! This was a great back and forth contest with Starr rolling Young up out of nowhere for the three count! After the match, Starr asked for the microphone and thanked the fans for all their support. He said its time he challenges for the PWP Heavyweight Championship and he doesn’t care who wins later in the night, he wants them in the ring in October! 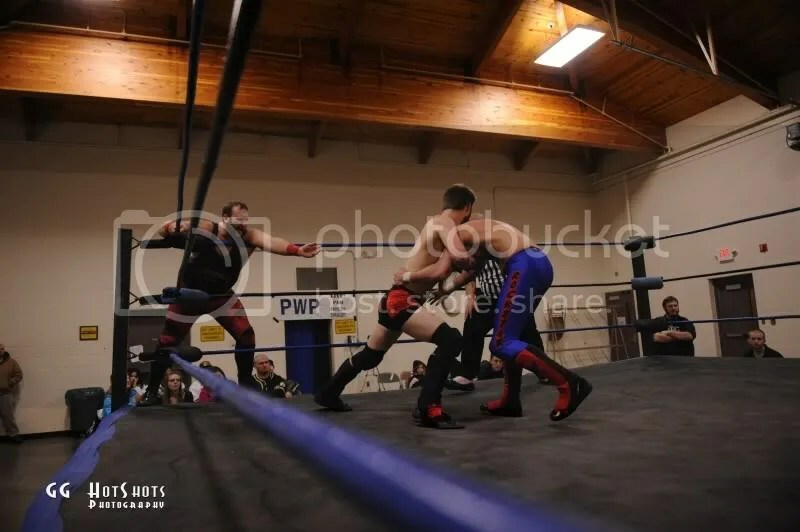 This was a very intense Triple Threat match as a returning Albright was looking to start fresh in PWP while both Daniels & Cornell need the win to move up the ranks in PWP. 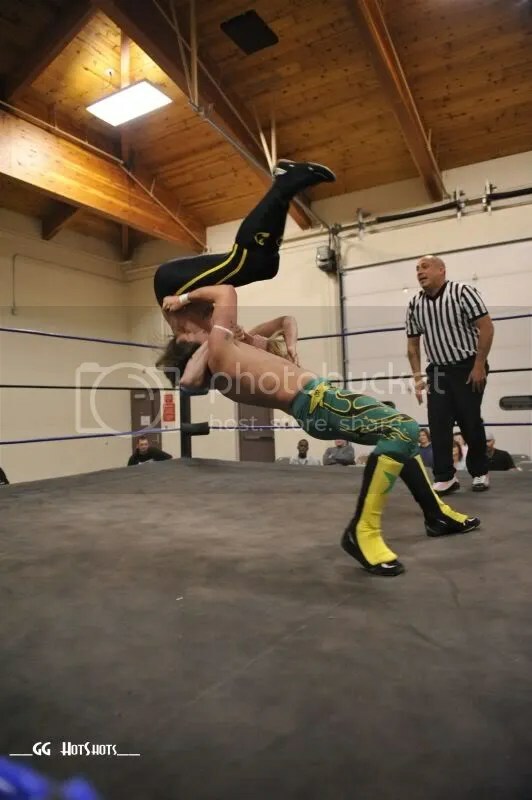 Highlights include a huge powerbomb neckbreaker off the top rope including all three men. Daniels sneaked into the ring and rolled up Albright to get the much needed win! This was a rematch from August 21 where Supafli showed the PWP fans that he could hang with a former PWP Heavyweight Champion. This match has to be seen to be believed! 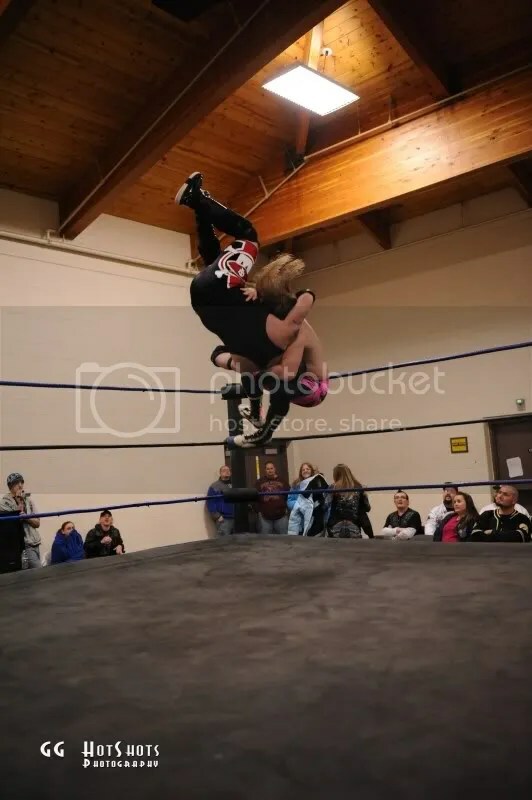 Amazing back and forth action between these two, as Strife showed his frustration, underestimating the masked man from Mexico City, IA. 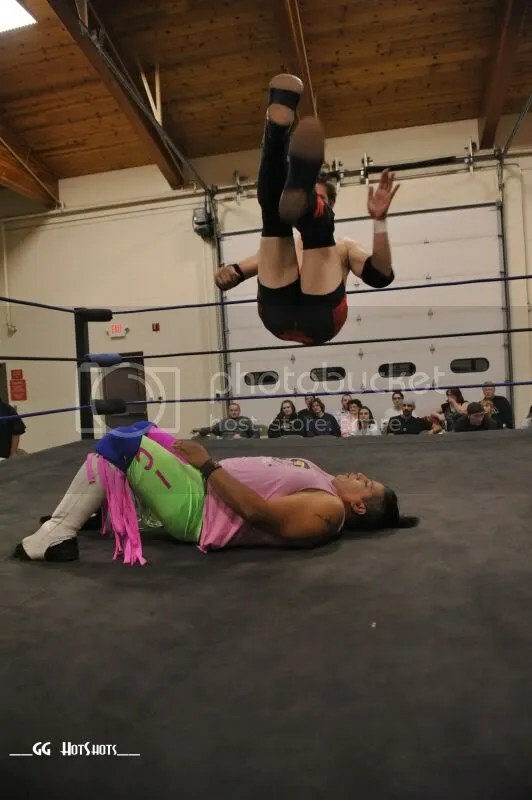 All sorts of innovative maneuvers came out of nowhere from both men but when Strife attempted a powerbomb, Supafli quickly rolled through, and had enough leverage to hold Strife down for the three count and the upset win! Strife seemed shocked at the end result, but he raised Supafli’s hand out of respect as the audience cheered. 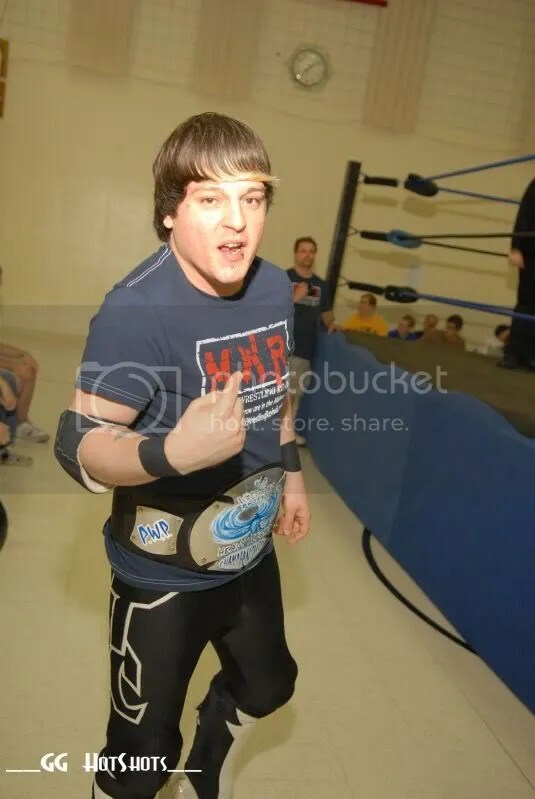 As we came back from intermission it was announced that PWP Officials had decided to grant Matty Starr a PWP Championship match on October 16, 2010! Abu Colossus’ music hit the arena speakers, however he did not come out. Preston Maxwell strolled out to his music, mocking his every move and mannerisms. Maxwell proceeded to insult the absent Colossus on the microphone, until his challenger, a returning Sydal came out. 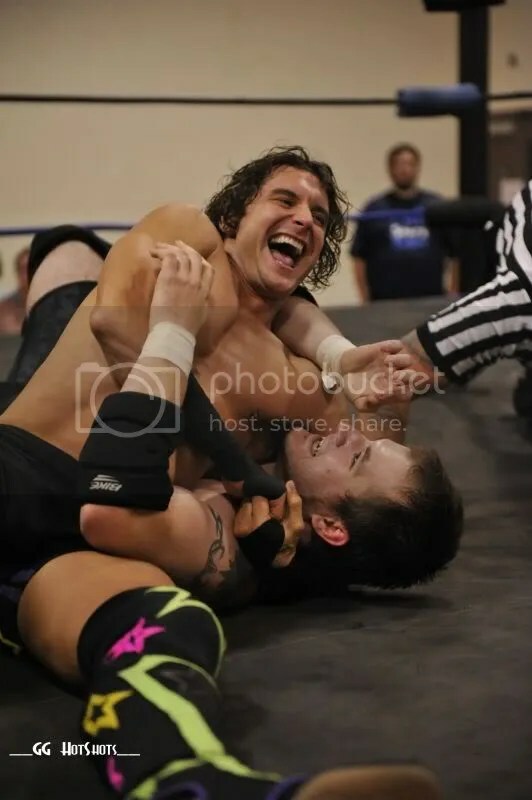 Sydal with a new style and energy attempted to use many traditional wrestling holds to subdue Maxwell during the match. A turning point occurred when Maxwell sidestepped the turnbuckle and Sydal flew into the ring post. The referee helped Sydal fix his injured shoulder but the damage had been done and when Maxwell locked on the Gator Roll Choke, Sydal couldn’t take the pain and tapped out immediately. You can be sure when Colossus hears about the disrespect showed by Maxwell, he will not be happy. 5. PWP Tag Team Championship: Zac James & Ryan Slade w/ Axel Greece retained the Championship over Chris Havius & Donnie Peppercricket. 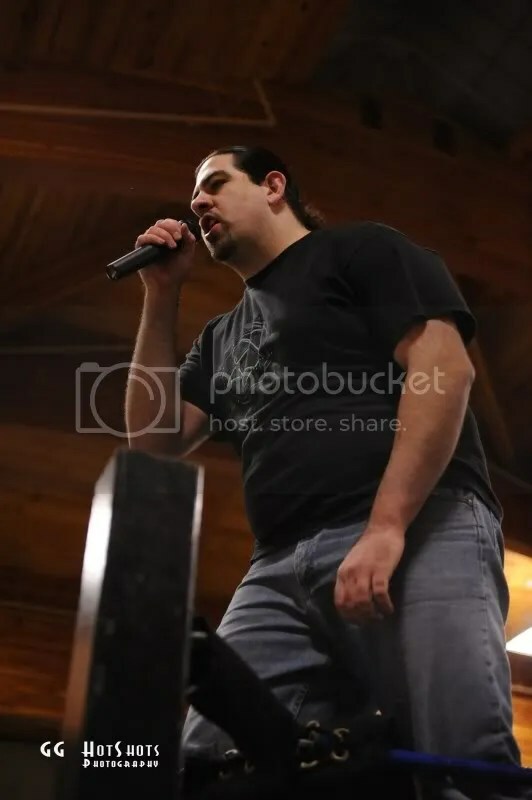 Before the match former PWP Ring Announcer Axel Greece got on the mic and berated his replacement, PWP Official BJ Bunten. He then offered Havius & Peppercricket a choice, they could go to the back and forget the match was ever supposed to happen, or they could do it the hard way. I think we all know which way the PWP favorites chose! This was a great tag team contest showing not only Havius & Peppercricket’s hatred for the Canadians but also the tightness of both teams. You could see the chemistry flowing and with Axel Greece in the corner it was a rough time for Havius & Peppercricket. 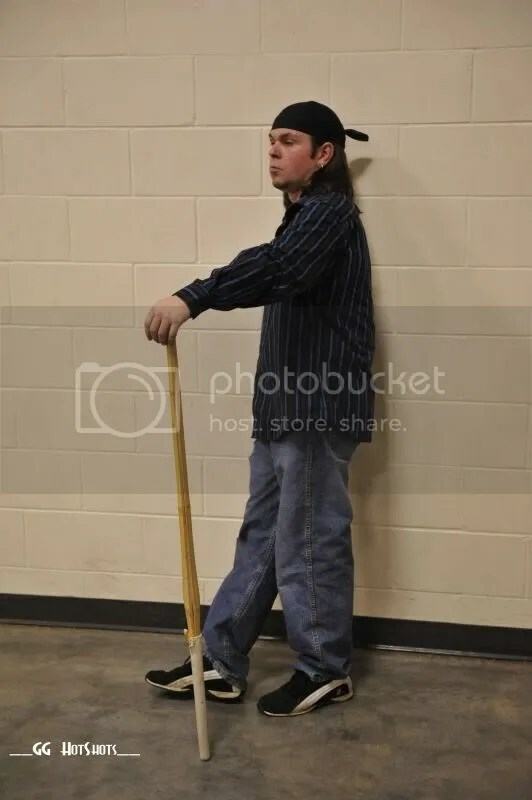 Unfortunately Greece was too much and as Slade baited Peppercricket into a brawl on the outside the PWP Referee Guy Walken followed them allowing Greece to hit Havius with his cane in the ring and James covered him as the referee returned to the ring and counted the three count. Havius & Peppercricket were livid and demanded that they get one more chance. They said this time, if they win, they get Axel Greece in the ring after the match for 5 minutes! Surprisingly, Greece accepted immediately, showing no fear and confidence that James & Slade could pull out a hat trick win. Months and months of torture, disrespect and anger came to a head in the main event of the evening. It seemed like Draigo was right around the corner of Cortez’ every move and was able to get the upper hand more than once. Cortez showed his tremendous heart and resilience after kicking out of not only 1 but 2 superkicks. You could see the look of shock on Draigo’s face! What happened next was probably the most controversial moment in PWP history. 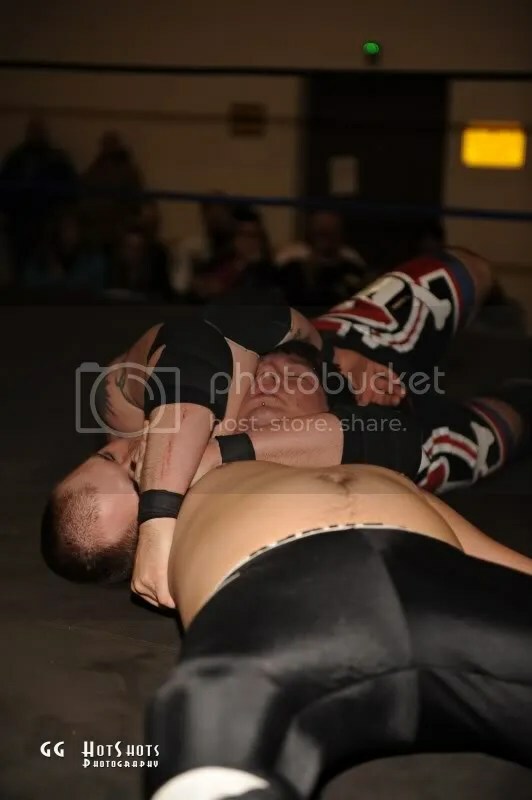 Cortez hit his finishing move, the Pacifier, on Draigo however Draigo’s feet knocked PWP Senior Referee Bryan Whitman out cold in the process. Cortez covered Draigo and the crowd counted along with him as he counted 1,2,3,4,5. Cortez got up to revive the referee and unfortunately this allowed Draigo to grab his Kendo Stick and nail Cortez over the head with it! Draigo dragged the referee over, and he counted the pinfall, 1,2,3! 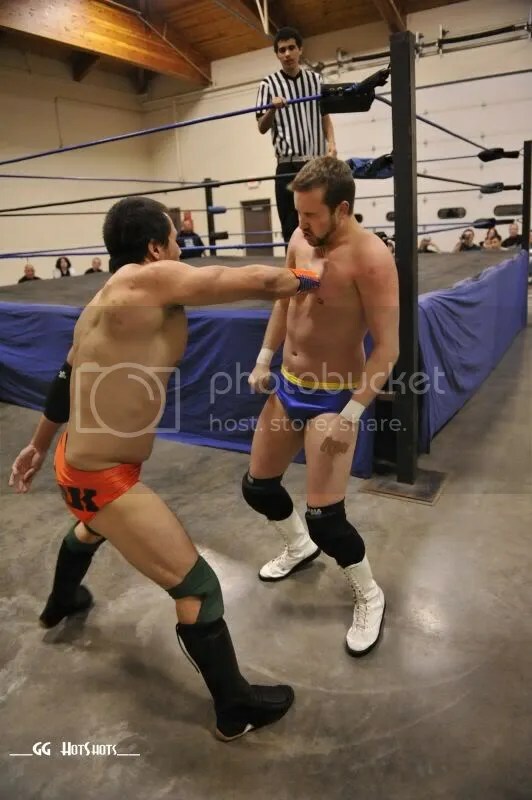 The referee called for the bell, however, PWP Official BJ Bunten refused to ring it! 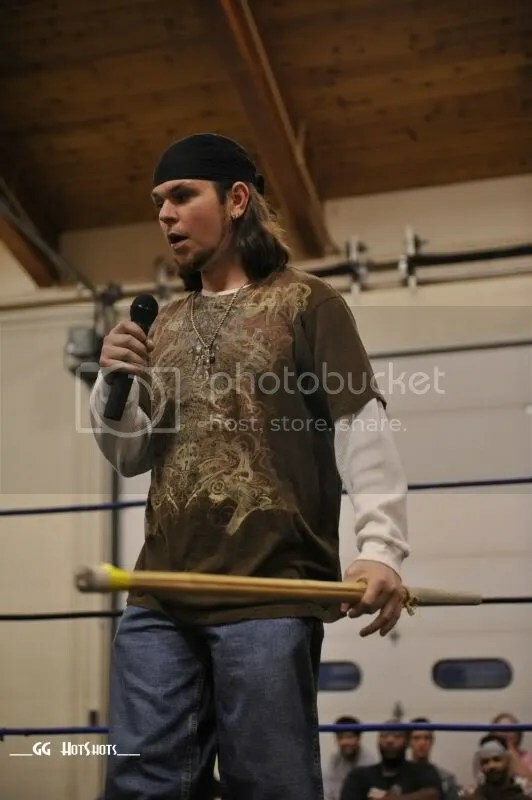 He couldn’t believe his eyes and refused to end the match because of the vicious Kendo Stick shot. 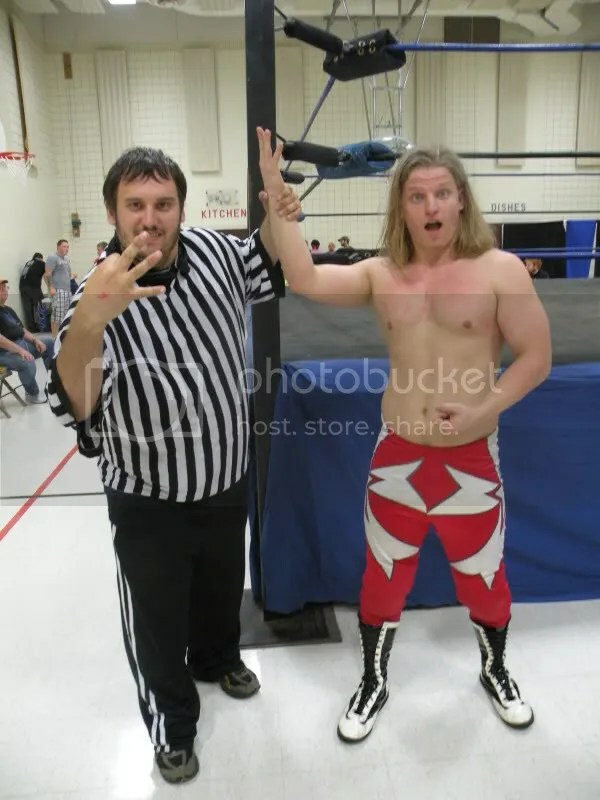 He went to the back and brought out PWP Referee Guy Walken as Draigo got the microphone and grabbed the title and began berating the fans and celebrating. As Bunten returned with the other referee, the two refs and Bunten began arguing over what happened. As this was going on, Cortez got up and hit a spinebuster on Draigo! The second referee ran into the ring and counted the pin but it was only a two count! 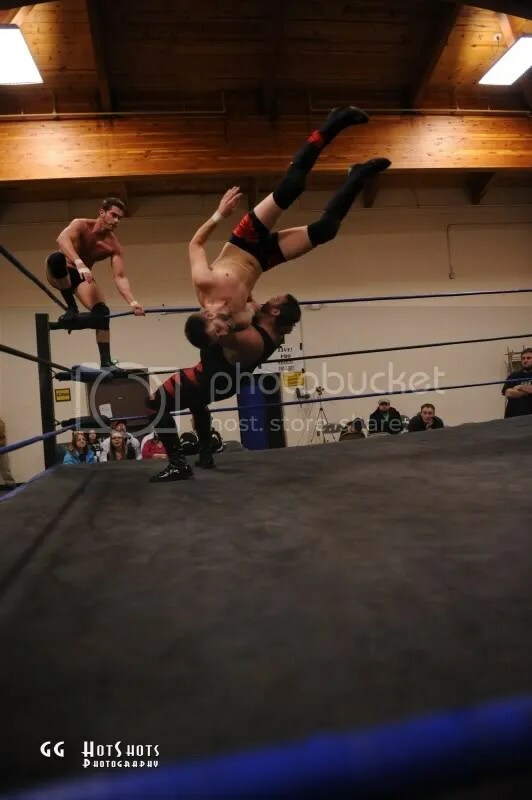 As Referee Whitman angrily left the arena, Cortez hit a crippling suplex into piledriver type move to finally get the three count and retain the PWP Championship. As Bunten announced the winner over the house microphone, the fans cheered Cortez and laughed at Draigo. Draigo left the arena but did exclaim that you would not see the last of him in PWP. Check the PWP Message Board for a statement from PWP Officials regarding the decision in the main event! PWP Heavyweight Championship Match: “Babyface” Tony Cortez Vs. Matty Starr. 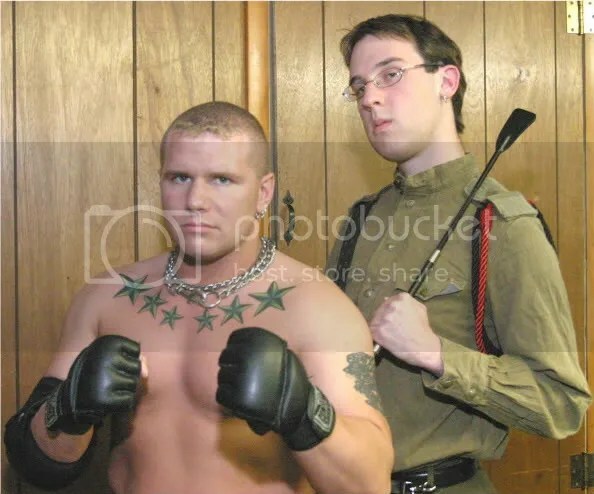 These two men are arguably the most beloved members of the PWP roster. Now they are putting it all on the line for the fans and Starr has an opportunity of a lifetime to taste the glory of the silver strap! PWP Tag Team Championship Match: Zac James & Ryan Slade w/ Axel Greece Vs. Chris Havius & Donnie Peppercricket. If Havius & Peppercricket win, they get Axel Greece alone in the ring for 5 minutes! If James & Slade win, Havius & Peppercricket can never challenge for the PWP Tag Titles again as long as James & Slade are champions! This could get very interesting! More will be announced soon! Thanks to all the fans for supporting us! MWR fans on August 21, 2010 we witness a thrilling night of wrestling at Pro Wrestling Phoenix with some of the top stars in the country. 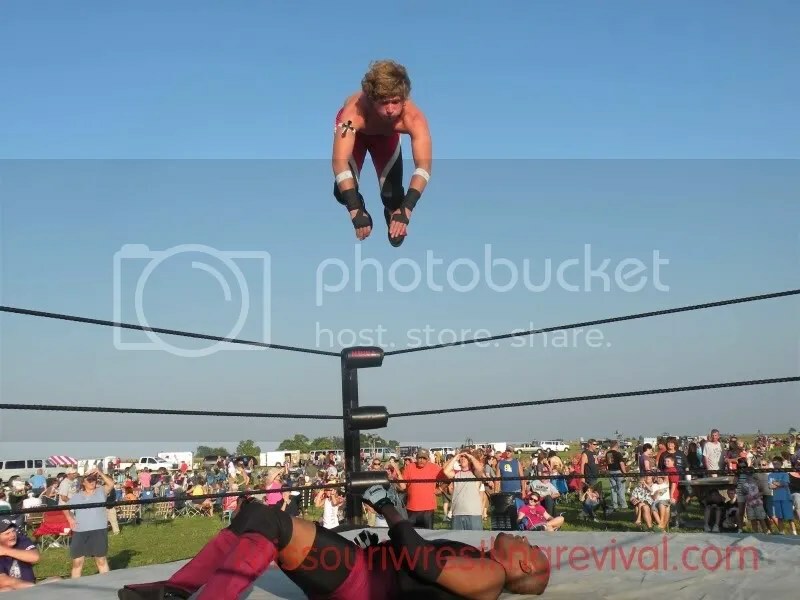 In the main event we witness Jaysin Strife jump over the top rope to allow Jayden Draigo to win the 2010 Battle of the Phoenix. 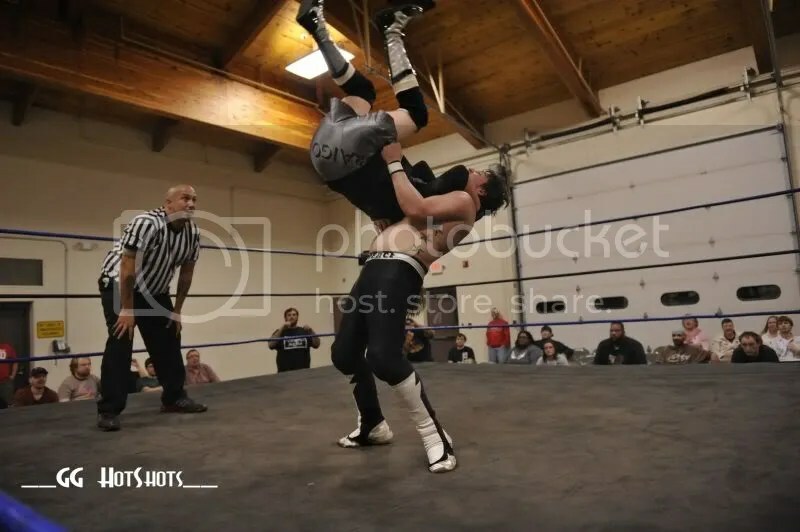 Thanks to our friends at Pro Wrestling Phoenix we have a full recap of the events including why Strife gave Draigo the win to go along with a music video of the amazing sights and punishing moves of each match. PWP returns to action on September 18th in Council Bluffs and we highly recommend that you take the opportunity to check out a great night of wrestling. As the evening started, “Babyface” Tony Cortez came out right away, and called out Jayden Draigo to finally fight him. Jayden came out to the ring and talked with Cortez about their history, and told Tony that the fans who loved him now were the same ones spitting on him and calling him Francis two years ago. He told him to make his own decisions and forget the fans then left the ring. As soon as Draigo left, “The Passion” Zac James’ music hit and he and Ryan Slade came out to the ring. Zac told Tony to put his title on the line right then and there, which most people assumed was Zac using his Anytime Anywhere title shot. 1.) PWP Heavyweight Championship: “Babyface” Tony Cortez defeated Zac James w/ Ryan Slade. This was an intense match with Zac showing a new intensity and focus on winning the championship. Unfortunately for him he fell short and Cortez retained his coveted title. After the match, Zac got on the mic and addressed the fans who were yelling at him that he wasted his title shot. 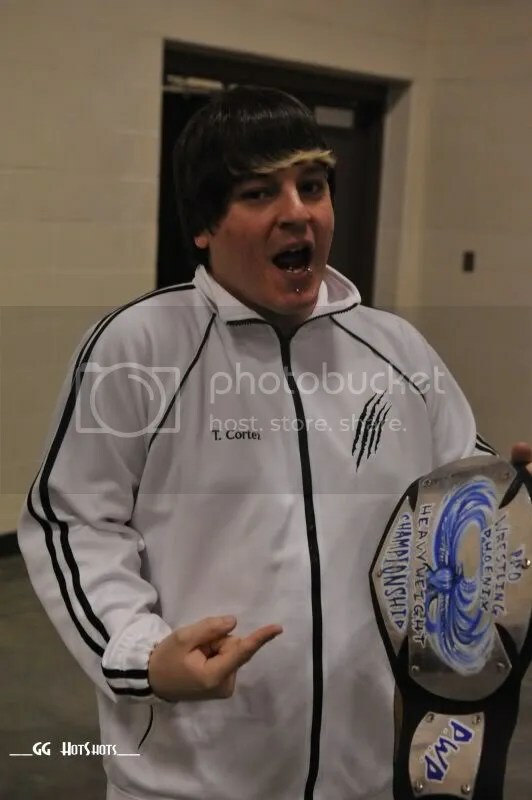 He showed them the contract and pointed out that he never said he was using his title shot, and he never signed the contract, therefore, he still had his Anytime Anywhere contract for either PWP Championship. 2.) 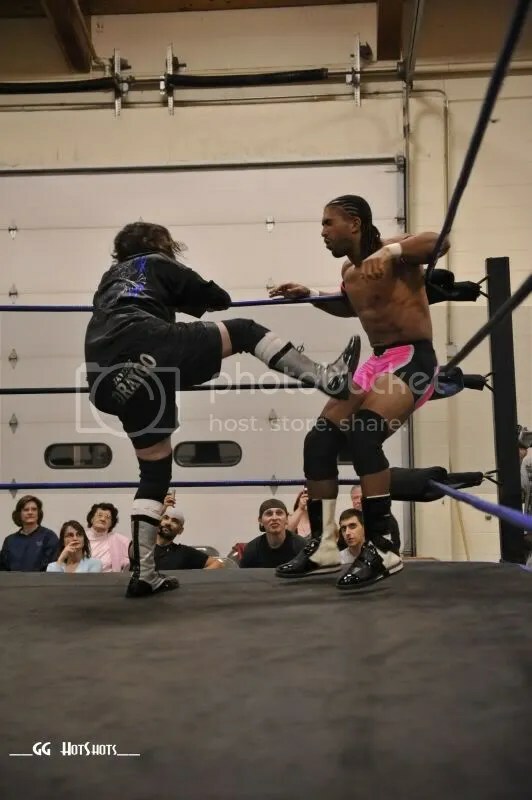 Sir Bradley Charles made his return to PWP and defeated Joey Daniels in a very back and forth contest. SBC pulled a lot of tricks out including a beautiful Northern Lights Suplex, but he finished it off with his TKO maneuver. 3.) 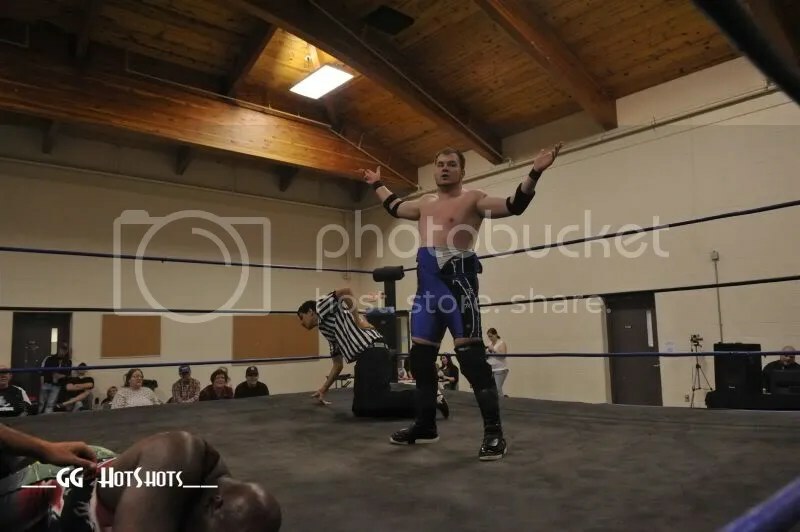 A returning “Rockstar” Jimmy Rockwell defeated Jayden Draigo via roll up when Tony Cortez appeared at ringside just long enough to distract Draigo. 4.) 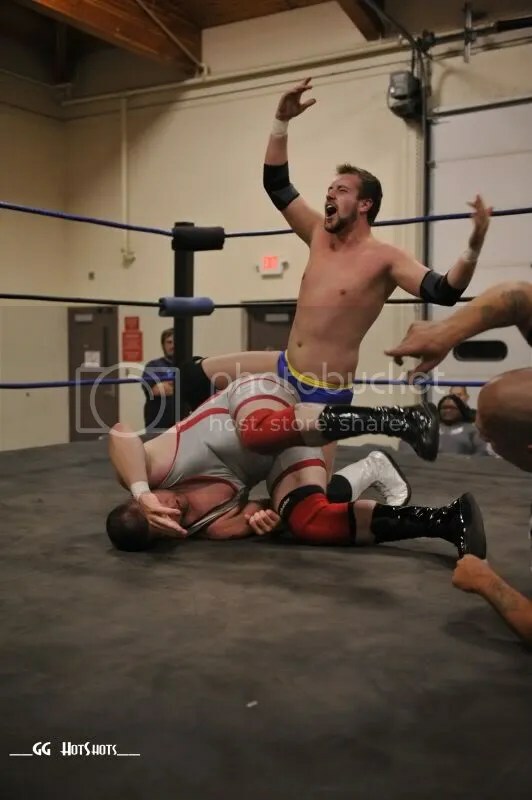 Matty Star finally got his revenge against “The Rebel” Jeremy Wyatt in this PWP classic. Both men used every ounce of strength & valor and kicked out of just about every move imaginable. The match ended when Star finally got the upper hand and nailed Wyatt with a Falcon Arrow from the top rope! This match is seriously one of the best contests in the 5 ½ year history of PWP. 5.) 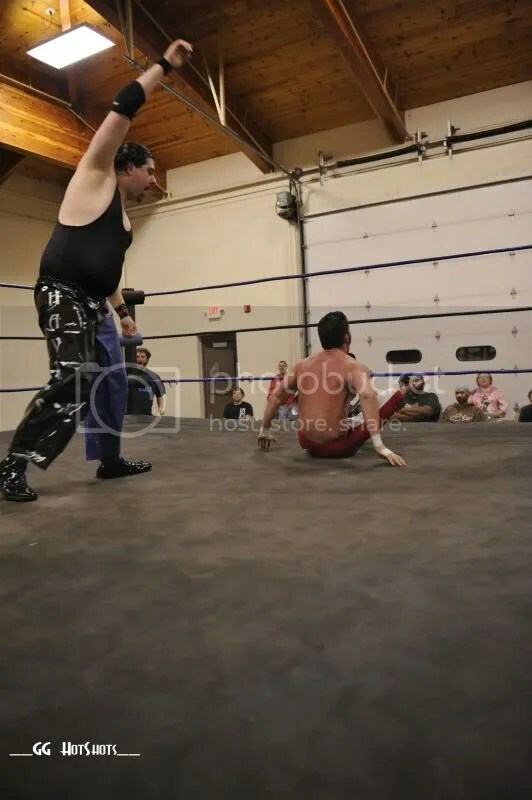 Abu Colossus defeated Preston Maxwell via disqualification when Maxwell had the Gator Roll Choke locked in on Colossus and refused to let go even when Colossus got his feet the the ropes. It took a few PWP officials to get Preston to break the hold who showed genuine frustration as he thought the match should have been his. He showed his lack of respect for Colossus who quickly gave chase. 6.) Jaysin Strife defeated Supafli in a fantastic match. 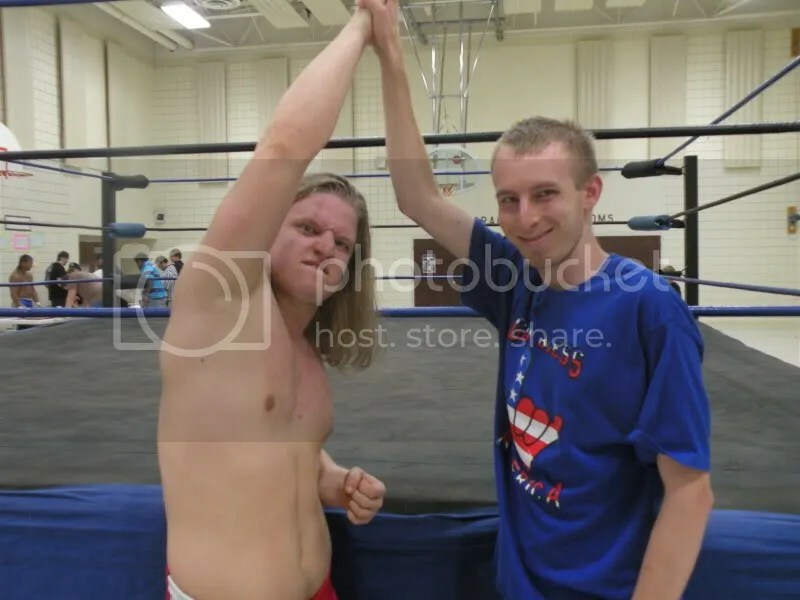 Supafli proved to the PWP fans that he can hang in the ring with a former PWP Champion. This match also saw Supafli severely cut open his chin on a dive to the outside. In the end Strife pulled out the victory but both men showed each other respect afterwards. This match was also a classic that won’t soon be forgotten, and was easily the best performance we have seen in Supafli’s young career. He proved that the sky is the limit for this exciting masked star. 7.) PWP Tag Team Championship Match: Chris Havius & Donnie Peppercricket defeated The Beautiful Bodies of Brian Gott & Derek Cornell. 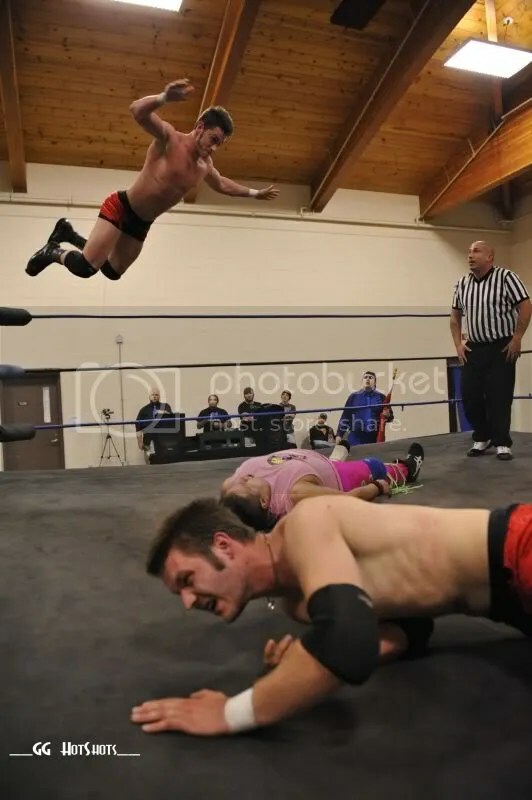 The Bodies were close in this one but not close enough and the PWP fan favorites retained their titles. As soon as the Bodies were out of the way, Zac James’ music hit ONCE AGAIN and he came out, clearly signed the contract and received his PWP Tag Team Championship match along with Ryan Slade. 8.) PWP Tag Team Championship Match: Zac James & Ryan Slade defeated Chris Havius & Donnie Peppercricket to become the NEW PWP Tag Team Champions. 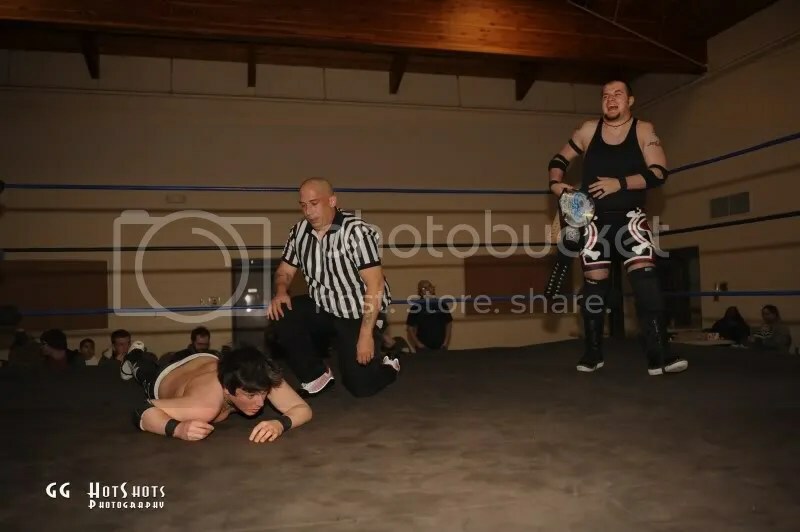 During the match, Ryan Slade attempted to use the Canadian flag as a weapon, however the referee caught him and took the flag away setting it on the apron. 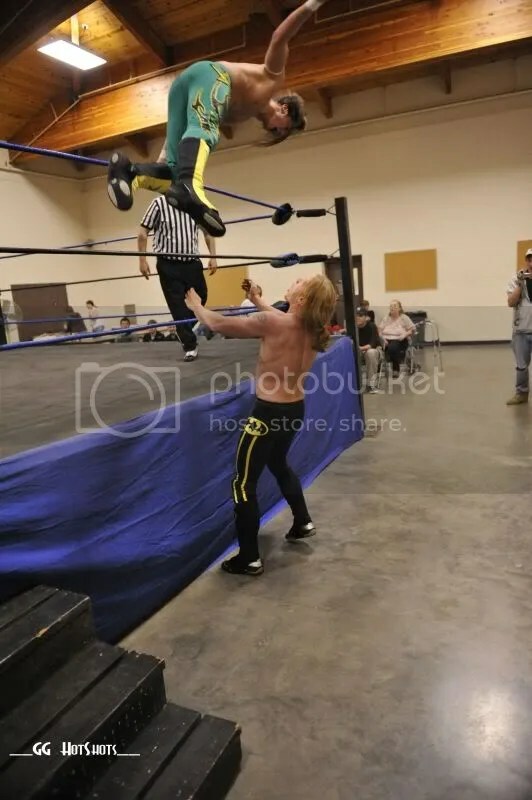 In a shocking turn of events, ring announcer Axel Greece grabbed the flag and nailed Peppercricket with it as he was attempting a tag team finishing move with Havius! Zac James then hit the Sliced Bread #2 and we had new tag team champions. Afterwards Greece got on the mic, announced the winners of the match and proclaimed that he was sick of being made fun of, beaten up, not taken seriously, and that he would lead Zac & Slade to greatness. He also proclaimed that one of them would win the Phoenix Challenge! 9.) Jayden Draigo won the annual Phoenix Challenge! 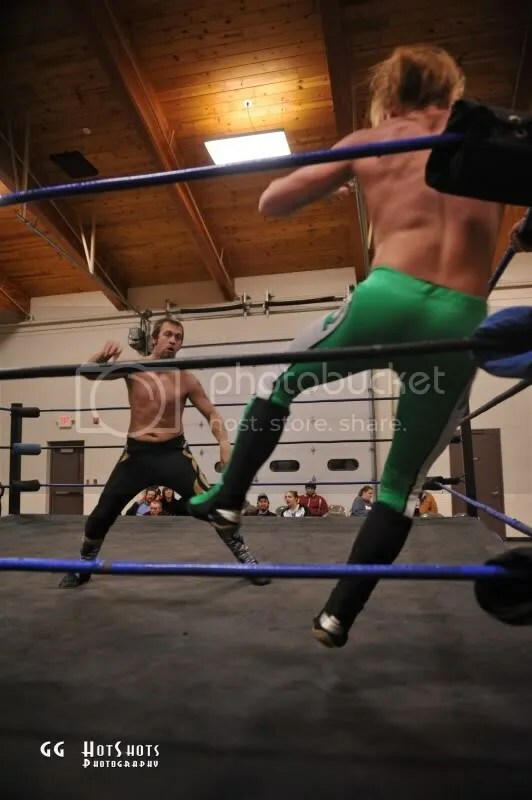 A lot of interesting things happened in the course of this match, including Havius & Peppercricket immediately going after Zac & Slade as soon as they got to the ring. Abu Colossus was the last entrant and as soon as he hit the ring he went immediately after Preston Maxwell who got eliminated while brawling with each other and probably didn’t even realize it. They kept fighting with each other outside the ring for a good five minutes, fighting their way back to the locker room. It came down to last years winner Jaysin Strife & Draigo, but Strife shocked the crowd by jumping out to the floor on his own! Draigo had the match won, but his look of glory soon turned to anger when Tony Cortez came out and the match was announced: Cortez would finally get his hands on Draigo September 18th when they fight one on one for the PWP Heavyweight Championship! Strife then said to Cortez that a deal is a deal, and now that Cortez will finally get his hands on Draigo – he needs to remember that Strife did him a huge favor, and Cortez still owes him another shot at the PWP Title. PWP fans! Battle Of The Phoenix 2010 was an incredible night full of shock and surprises! Join us on SEPTEMBER 18, 2010 at the Council Bluffs National Guard Armory for a huge night of live pro wrestling! 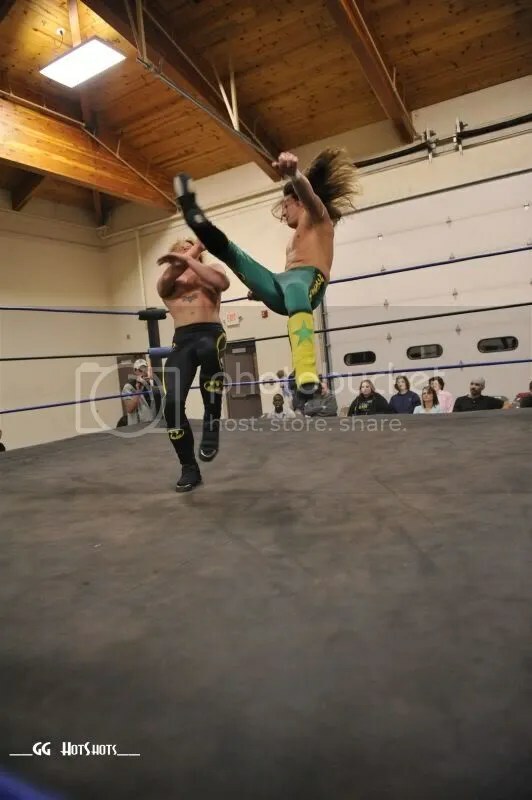 Jayden Draigo has been a thorn in Tony Cortez’s side ever since he returned to PWP. Last month, Jaysin Strife jumped out of the ring and allowed Draigo to win the annual Phoenix Challenge. Tony Cortez came out and it became clear that a deal had been made. After months and months of Tony trying to get his hands on Draigo, it will finally happen! Will Tony Cortez continue to prove why he is the champion? 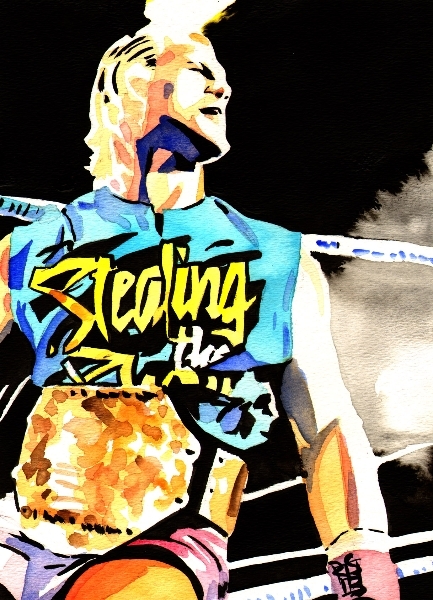 Or will Draigo find a way to steal the title away from Tony? 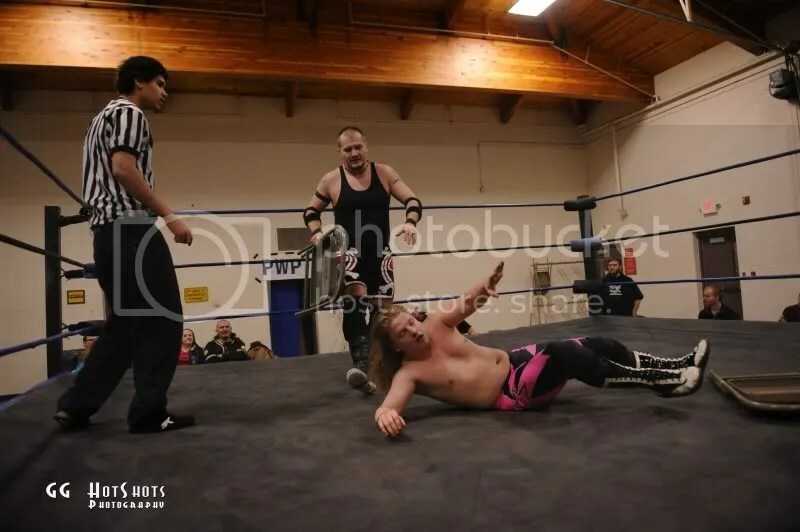 Last month saw Zac James finally cash in his Anytime Anywhere contract, and he cashed it in right after PWP Tag Team Champions Chris Havius & Donnie Peppercricket defeated the Beautiful Bodies. 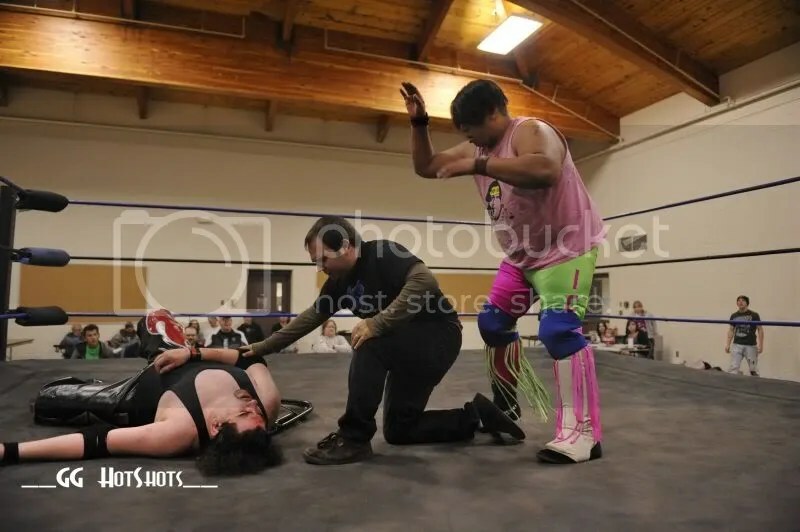 In a huge shock to everyone, former ring announcer Axel Greece attacked Donnie Peppercricket during their match allowing Zac & Slade to pick up the victory. He then announced to the world that he was sick of being joked on, not taken seriously and ignored, and he would lead these men to greatness. Havius & Peppercricket will no doubt be looking for huge retribution in this match, and they will be fresh. Who will take home the titles? 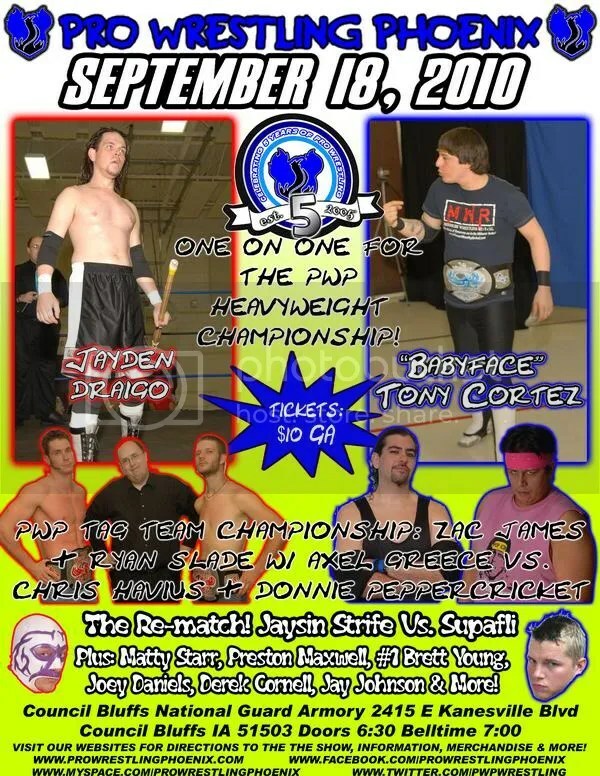 One match that was talked about so much by all the fans from our August event was Jaysin Strife Vs. Supafli. Supafli has asked PWP officials for a rematch, and because there has been so much buzz about this match, they have agreed! You won’t want to miss this! 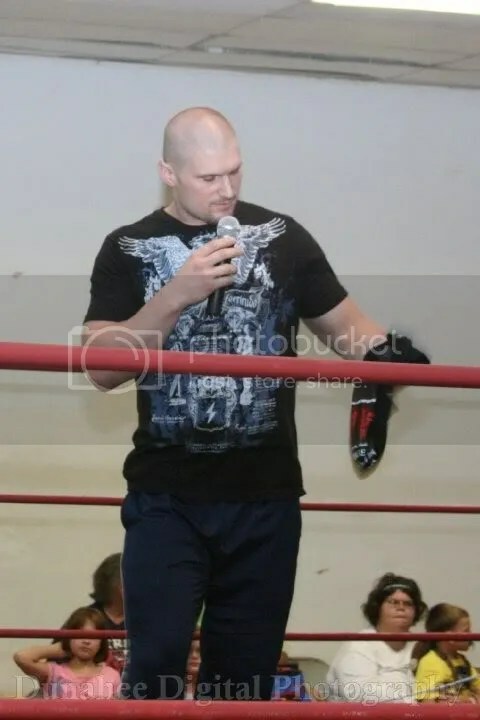 #1 Brett Young will be in attendance and word has it that he will be issuing his “One Shot Challenge!” Last time this happened, Abu Colossus answered the call and defeated Young. Will he taste defeat again, or will he come out victorious? ALSO IN ACTION: Abu Colossus, Matty Starr, Preston Maxwell, Derek Cornell, Joey Daniels, Jay Johnson & more! Our trip to Council Bluffs, Iowa turned out to be on a beautiful day. With the fall season upon us and school around the corner for both us we knew we had to make our way to Council Bluffs Iowa just in case we were unable attend later due to time. 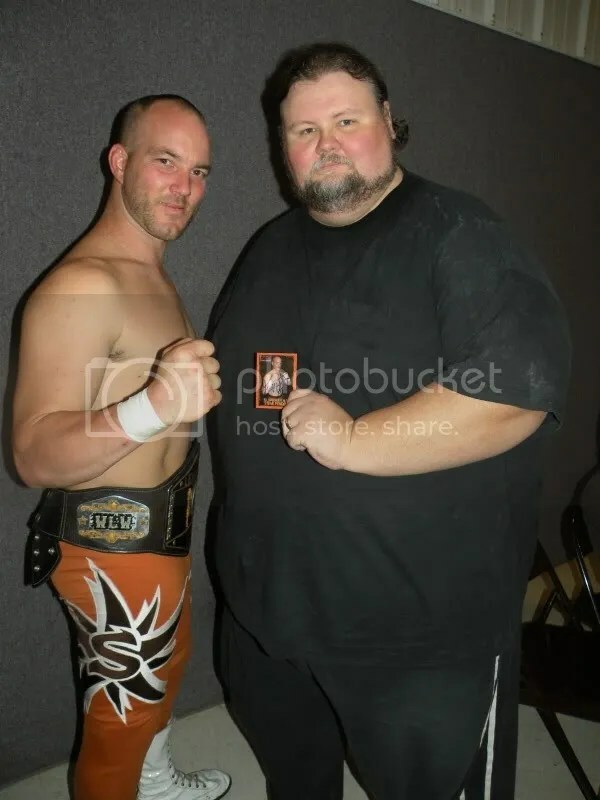 Brian was excited about seeing Gary once again, and had brought him up a complete set of the MWR Trading cards that have several that feature his photo work such as the Mike Sydal, Sir Bradley Charles and the chilling Jeremy Wyatt card that looks a little sinister. Gary made the trip worth it by giving me a hug (You know I need my attention, I am Dubray of course) so the night had started off right. Prior to saying our hellos to the staff, we decided to find the restroom that was located in the hallway. Before I got done Brian was talking to some fans that were there an hour early waiting for the doors to open. Brian told them what we were doing and Nancy stated that her favorite was the BIG Abu Colossus. She stated that every time he came out prior to his match she liked to get up and do a dance to let him know that she was on his side. We promised her that if Abu was there on the night she would be among the Dubi Meets the fans. The doors opened at 6:30 so off the work I went to find fans that were interested in being a part of this edition of Dubi meets the fans. Brian and PWP must have advertised it good or they remembered the last time we did it at PWP and didn’t want to miss it this time because there was a ton of people wanting to get their picture with the PWP Superstars. Our MWR Wrestler of the night was none other than the PWP Champion Tony Cortez. 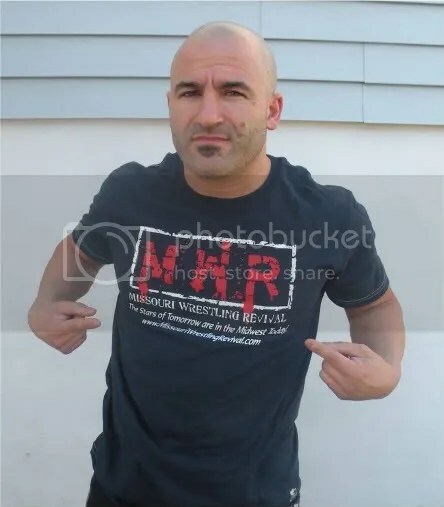 Cortez wore the MWR shirt prior to starting the night off with impromptu win against Zac James. Before the match started he threw the shirt to Ben Castillo from Fremont, NE. During the intermission he took the time to meet the young fan. 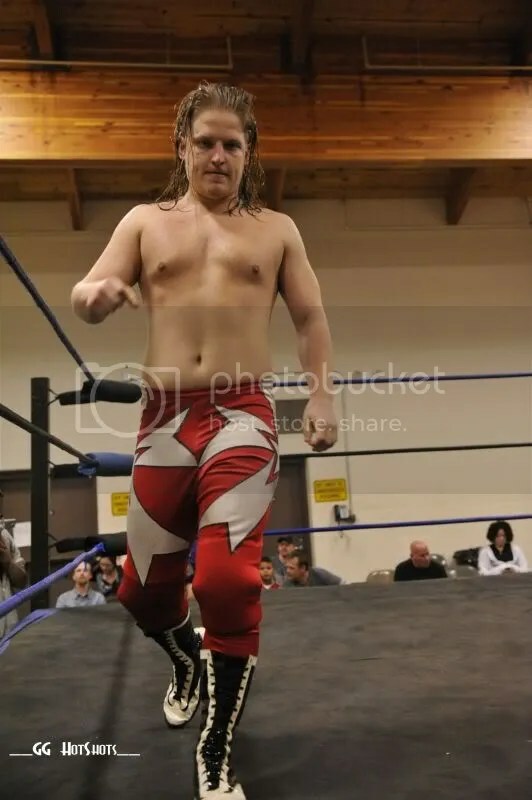 One fan that was a lot of fun to watch during the matches told me his name was Daniel “The Power Deaf” Gilchrist from Glenwoood Iowa. When the wrestlers would kick out just in time for the final 3 count he was really into it. 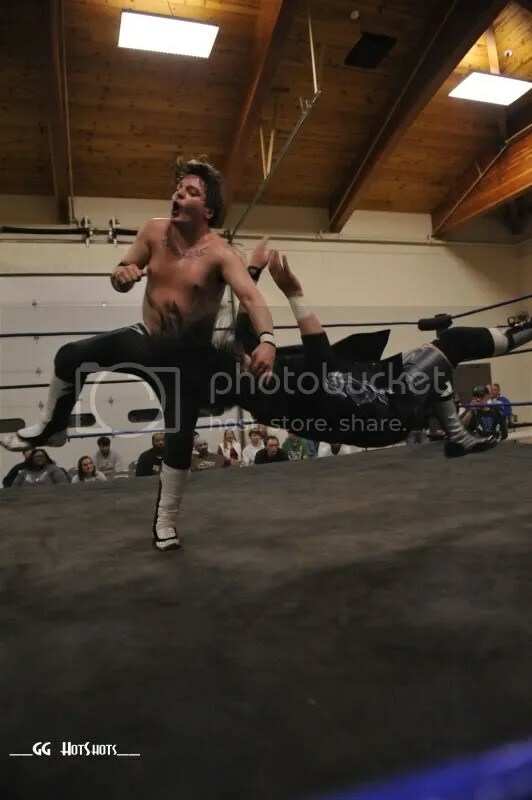 He wanted Jayden Draigo but Draigo I was told has been a terror at PWP for some time and can be uncontrollable at times so Brian asked if he could choose someone else. He quickly chose fan favorite Matty Starr. Ron Blair had no hesitation to who he wanted to have his picture with it was the ever popular Donnie Peppercricket. 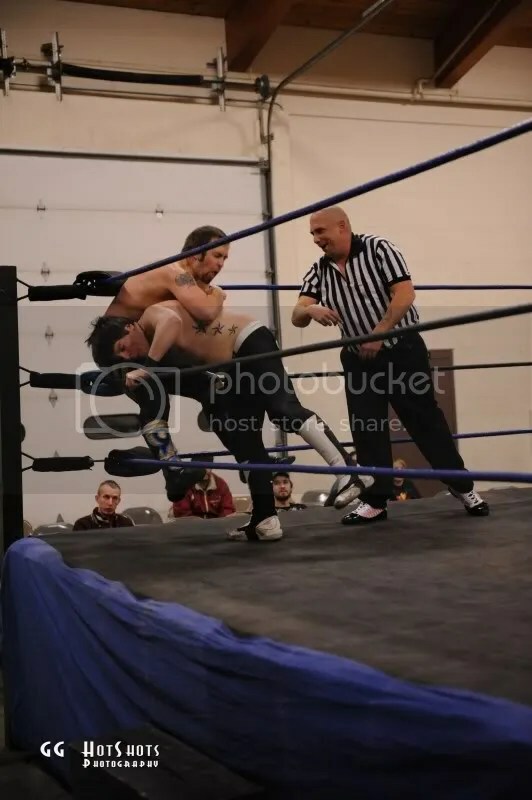 Young Michael Barnes from Council Bluffs Iowa was at PWP to see the exciting Jaysin Strife in action. Strife was more than happy to get his picture with Michael. 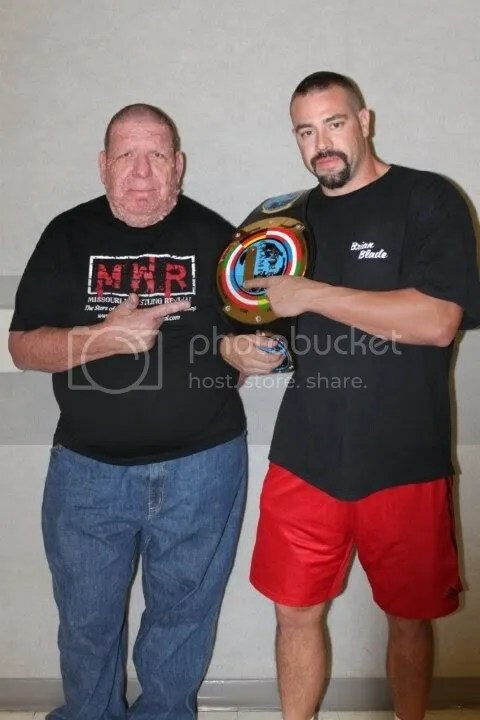 A regular of Pro Wrestling Phoenix was John Striffler from Omaha Nebraska who told me that he had been a big of wrestling for over sixty years. John told me that he always enjoyed coming to Pro Wrestling Phoenix and tried to make every show. 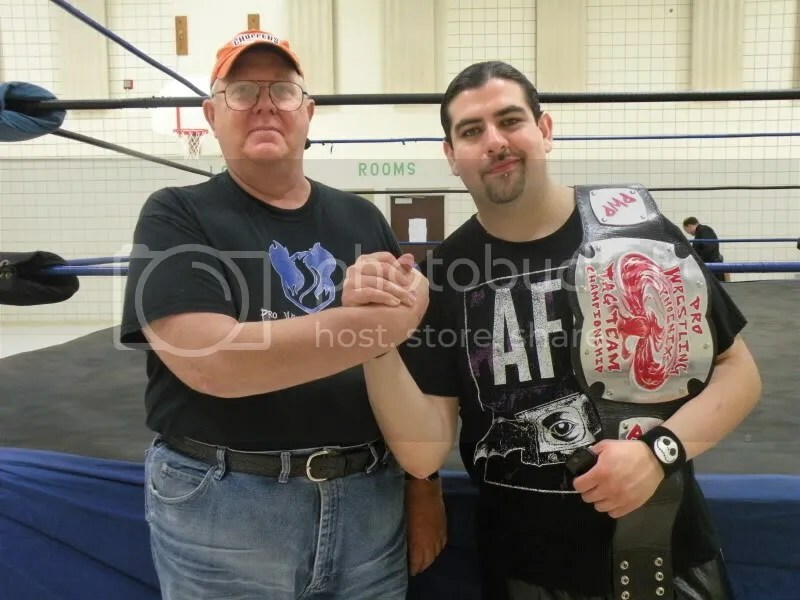 John told me that he was a fan of Chris Havius who was one half of the PWP Tag Team Champions along with Donnie Peppercricket. 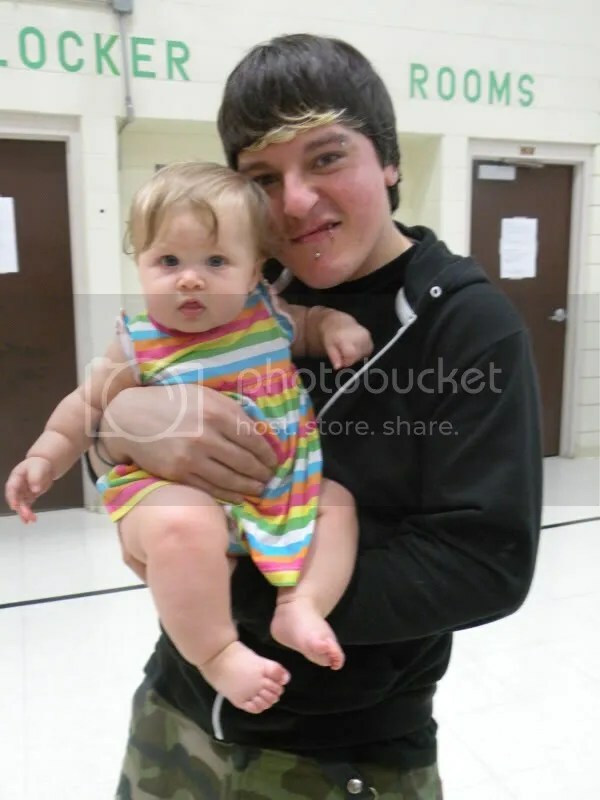 As we were taking pictures I was told that little bitty Kaycee’s favorite wrestler was Tony Cortez. Cortez was nearby and snapped the shot of the youngest fan to ever take part in the Dubi meets the fans. 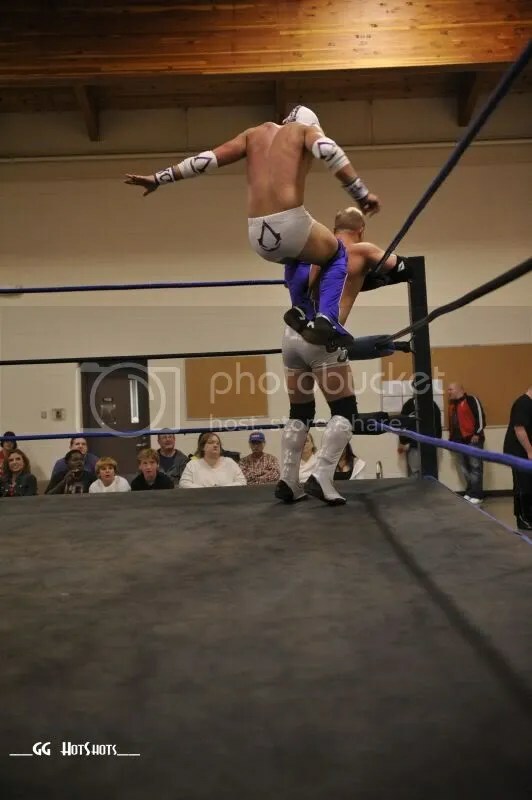 The last time we were at PWP Matty Star was in high demand and on this night it was no different. Starr has been making waves in 2010 where ever we go and we are not the only ones that noticed because just like Daniel “The Power Deaf” Gilchrist, Joshua Pope was all smiles as he posed with Matty Starr. 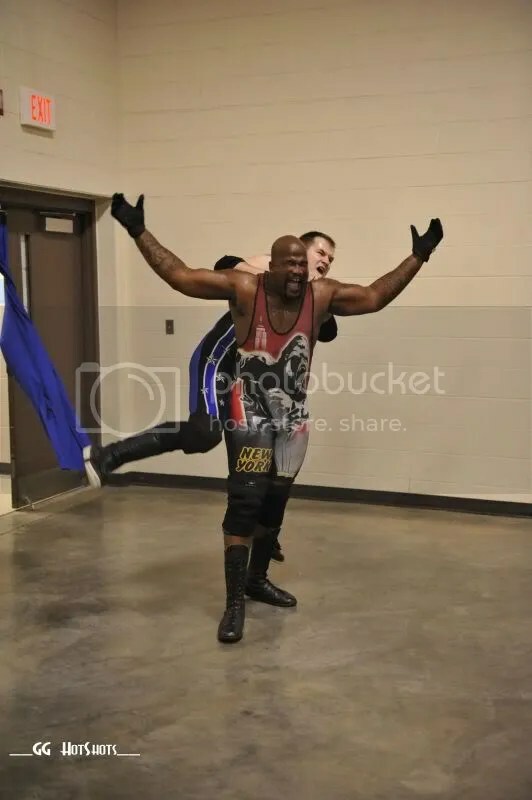 Abu Colossus had his hands full on this night against Preston Maxwell but before his match after intermission he took a snap shot with Nathan Gilchrist. 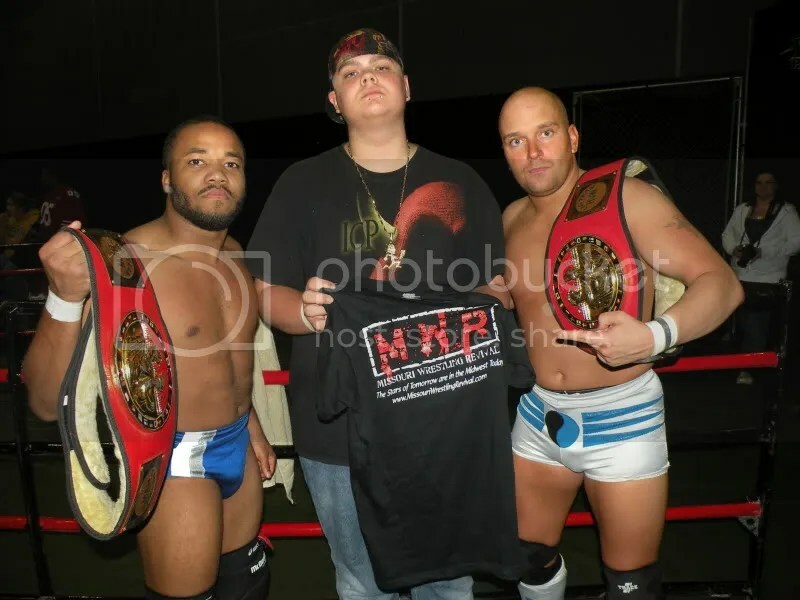 Adam was a fan of the PWP Tag Team Champions, Havius and Peppercricket and may have been the last person to get their pictures taken with the duo as champs. They would take on the Beautiful Bodies, and would retain the titles but you will have to wait for the recap here at MWR (Or click on the PWP Website if you can’t wait) to find out who would leave Battle of the Phoenix 2010 with the belts. 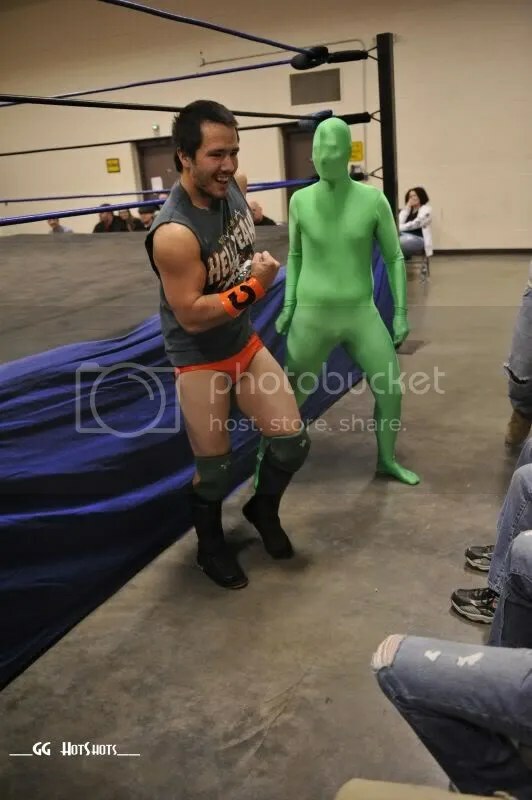 The last fan that I will introduce you to was really excited to be at PWP and was very excited to have their pictures taken with the PWP wrestlers was Mike Firk. Mike would ask to have his picture taken with Matty Starr, Chris Havius and Donnie Peppercricket as well as catching me after the show excited about getting his picture taken with the lovely Angelus Layne and Jaysin Strife. I looked around to see who my pick on this evening would be and noticed that Sir Bradley Charles had just got done meeting the fans and selling the awesome looking SBC shirt to a fan and had a moment so I asked him to be my Dubi Meets the fans choice and Jaysin Strife was nearby so why not add him as well. 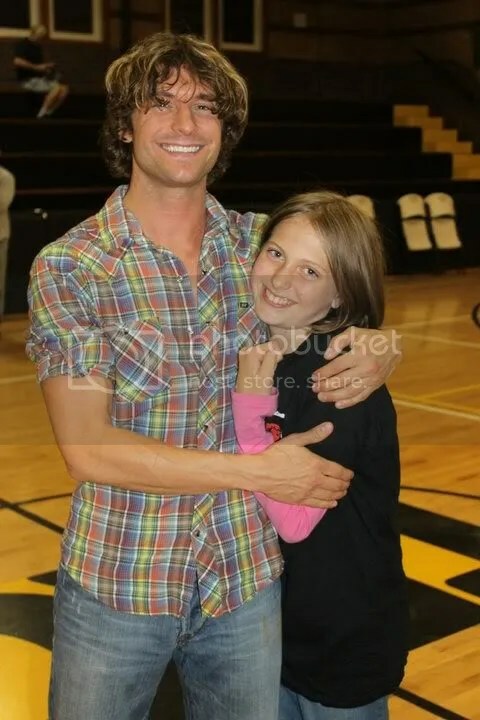 Fans I hope that you enjoyed this edition of Dubi Meets the PWP fans and for more pictures of these fans with their favorite wrestler please click here to see them. We hope to have a full recap of this show along with MWR’S Introducing Angelus Layne. Till next time be good and I hope to see you at the show. In a shocking chain of events the PWP fans witness Strife voluntarily eliminate himself allowing the hated Draigo to pick up the victory! Out came the champion, and Strife let Cortez and the fans know that a deal had been made. You will not want to miss is it fans when Tony Cortez defends his PWP championship on September the 18th in Council Bluffs Iowa. We caught up with the challenger Draigo after the show and he had this warning for Cortez. Also on tap will be full photo recap of all the hard hitting matches at Battle of Phoenix 2010. What can’t wait for then let’s take a look at one picture that you will not soon forget. That’s not all; There are new PWP Tag Team Champions and they are Ryan Slade and Zac James, what PWP worker played a vital role in their victory? MWR caught up with the new champions and former ring announcer Alex Greece who used the Canadian flag on Champions Chris Havius and Donnie Peppercricket costing them the belts. The ever popular Dubray Tallman was busy with a brand new Dubi Meets the Fans. This and much more coming your way at the number one site for all your PWP News.